I have always been a fan of this gorgeous fabric. 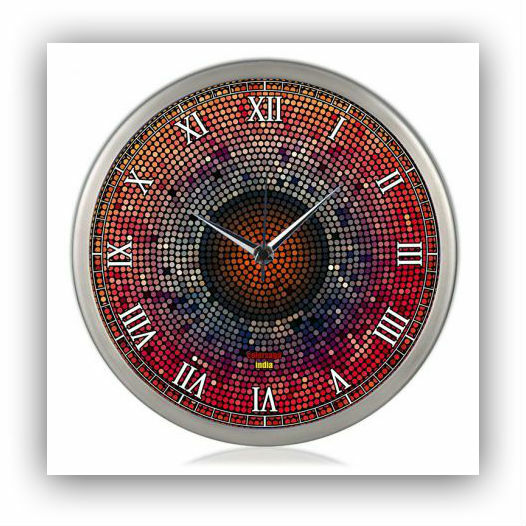 The crisp texture, the sheen, the vibrant colours and the variety of motifs and designs. I have incorporated silk be it in the form of curtain panels or cushion covers at home, even silk sarees get me thinking on how they can alternatively be used in home decor. Stores such as FabIndia have some lovely home furnishing products in silk, and the expensive rates are the only reason I’m not buying more of them. But after my trip to Narayanavanam in Andhra Pradesh, I have come to realise the immense effort behind silk weaving especially in handwoven products and the rate we pay for it is more than justified for the hours of labor invested to produce this lovely material. 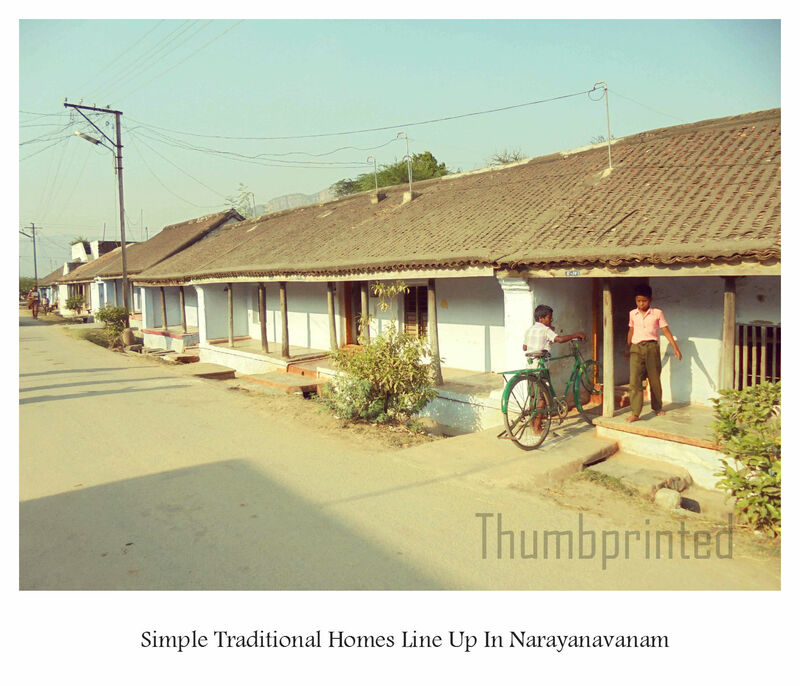 On the outside the village looks like any other, simple looking traditional homes, simple people and their chores of cooking, visiting the nearby temple and kids playing on the streets. But if you peer into one of the low laying windows of these homes, you can be transported into a world of grandeur, colour, texture and pattern; the world of silk. This village has been producing silk sarees for many generations dating back to decades before India got its independence. The art has been passed down several generations and they swear by handwoven silk. While there seems to be no comparison to handwoven silk products, the sad truth is that this is a disappearing craft. Machine weave is picking in popularity because of its ease and need for less time and human resource. Also the current generation among the weaver community are interested in better paying city jobs and are unwilling to carry on tradition. Q : Where does the raw silk come from? A : We do not produce silk in this region. 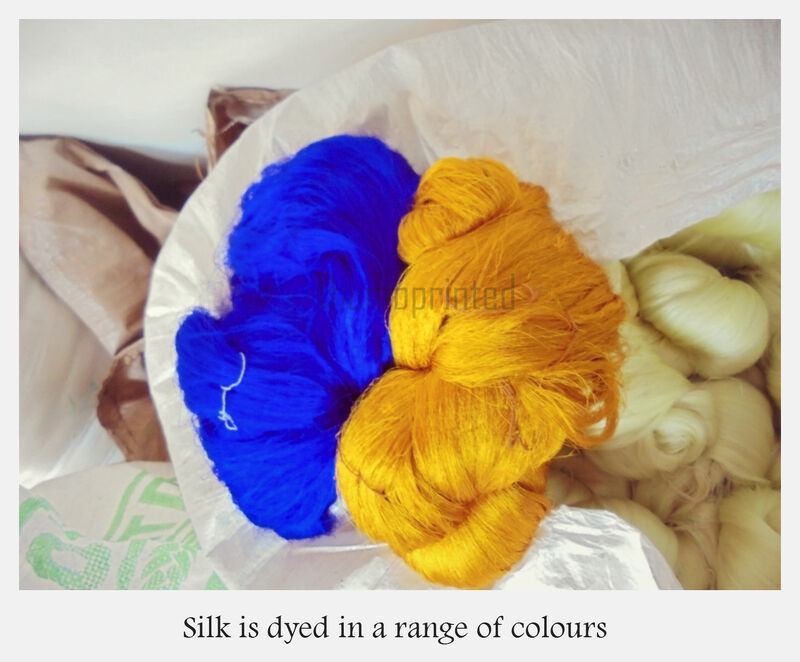 Silk farming happens in regions of Karnataka around Bangalore and we receive silk thread from there. 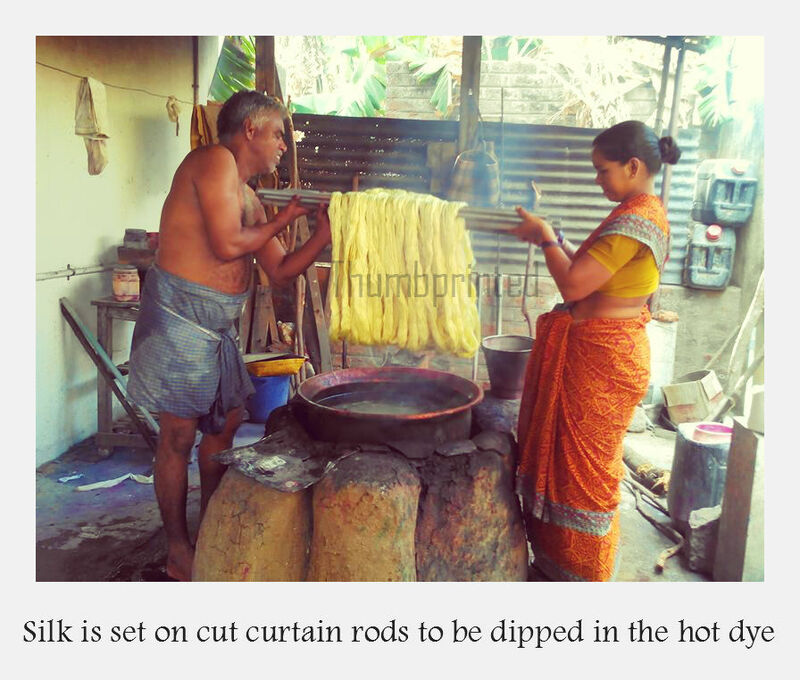 The process in Narayanavanam begins at the dyeing stage. 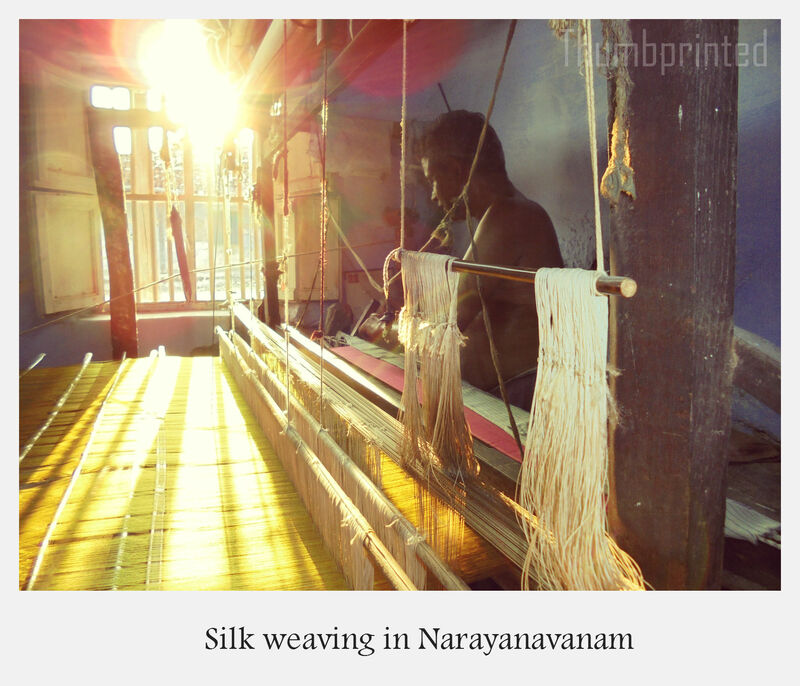 Q : What is the first stage of creating a silk saree, here in Narayanavanam? 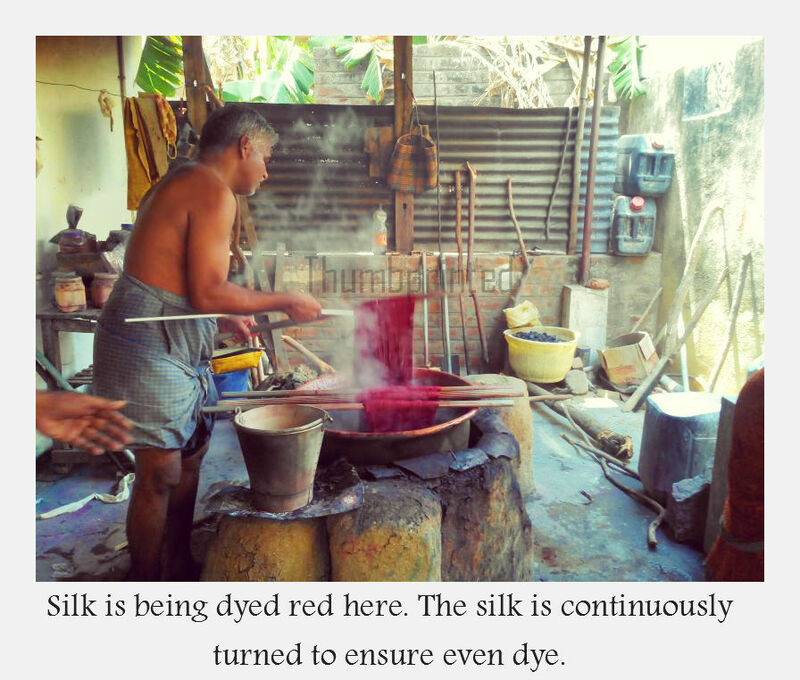 A : As you must have seen, silk sarees are produced in a range of colours. Sarees can be of a single hue, double hue or even multiple hues. The raw silk comes in an off-white or creamy colour and we dye these in different colours depending on the saree. We have specially built stoves in the open to boil the different dyes in water, we wash the raw silk and then dip them in these dyes, ensuring all parts are completely dyed, by repeatedly turning and dipping. Then we again wash it multiple times in water and allow it to sit for a while in a fixing agent to ensure permanency of the stain. The entire process may take between 2 -4 hours. 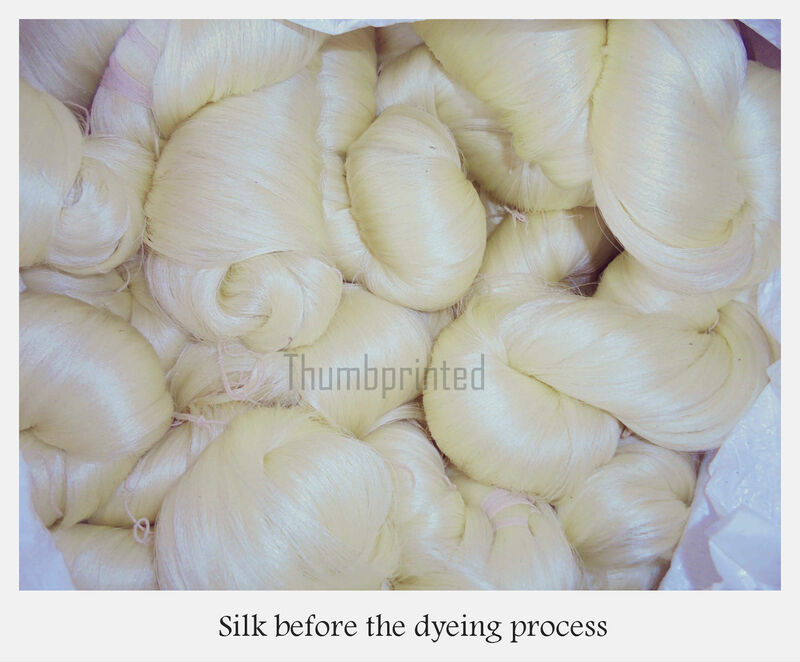 The silk is then set to dry and kept aside for the warping process. Q : What about the Jari thread? A : We get the Jari thread from Surat. 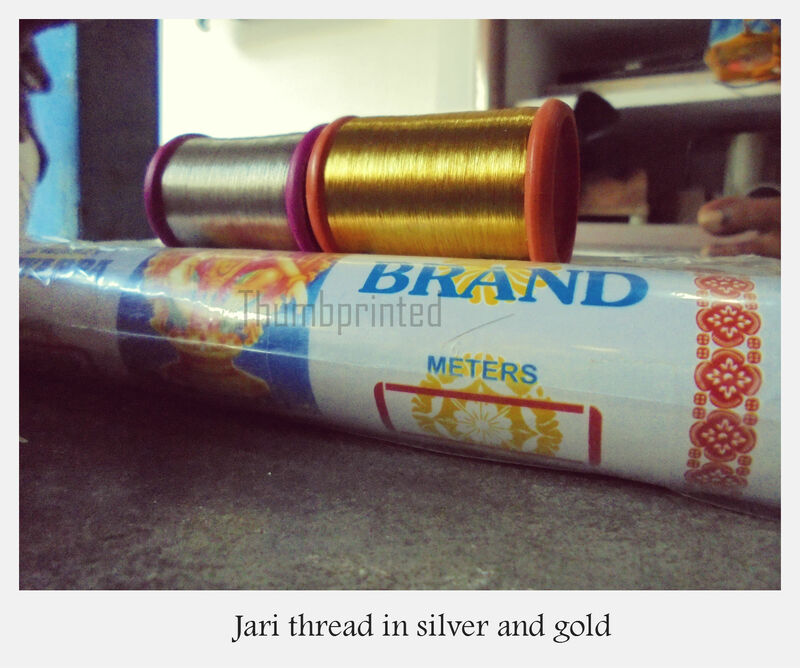 The genuine Jari have silk thread coated with real silver and then coated in gold thread. Jari that is cheaper may not have silk core and silver coating. 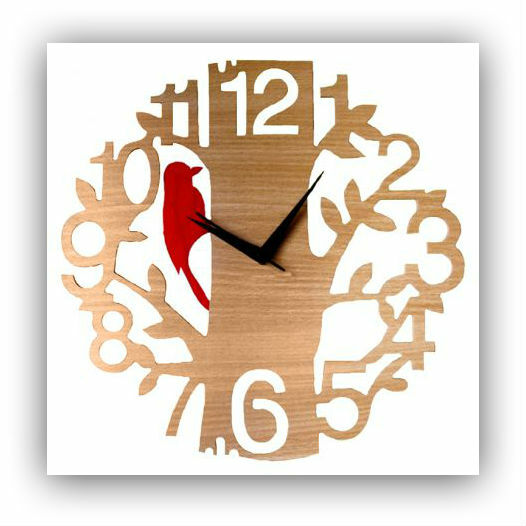 They are also available in different colours, most standard being silver and gold. Q : What process do you do with the Jari? 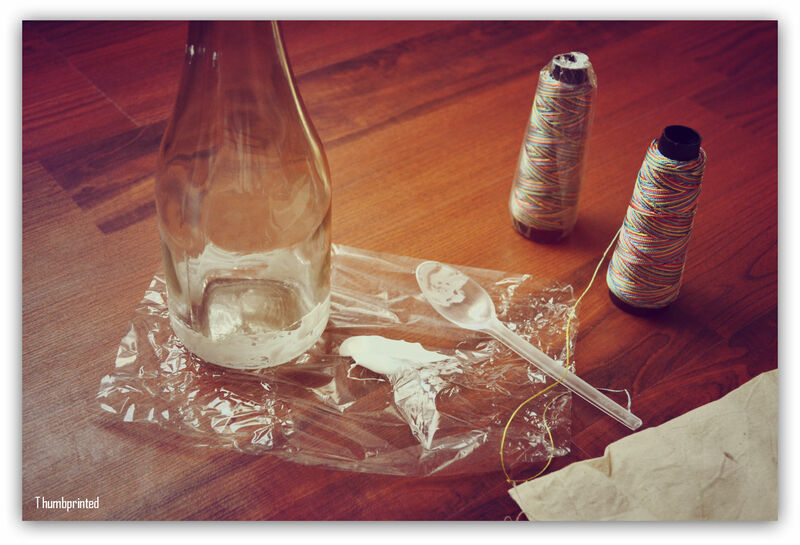 A : They come in small spools, we first transfer it to cut plastic pipes with the help of a simple device. 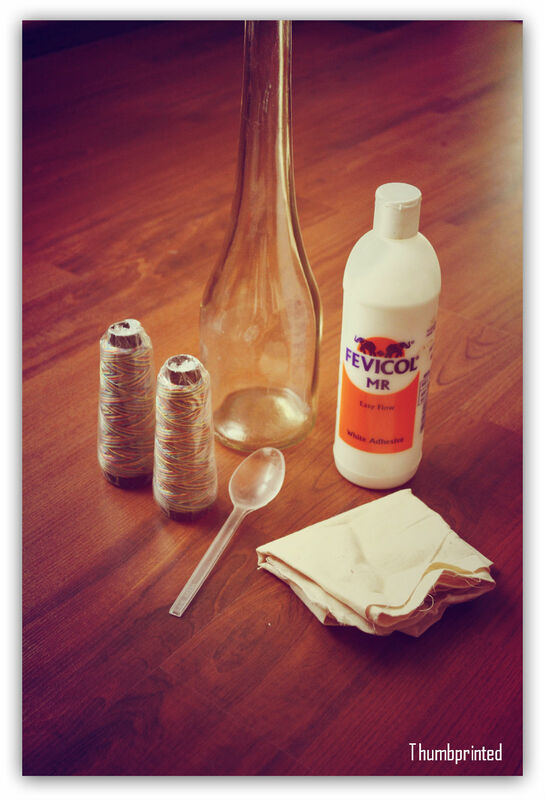 This process is done first to make it smoother and reduce the possibility of breakage. This Jari on the pipes is then again transfered based on the saree design, for the border or bhuttas, by another rotational device. 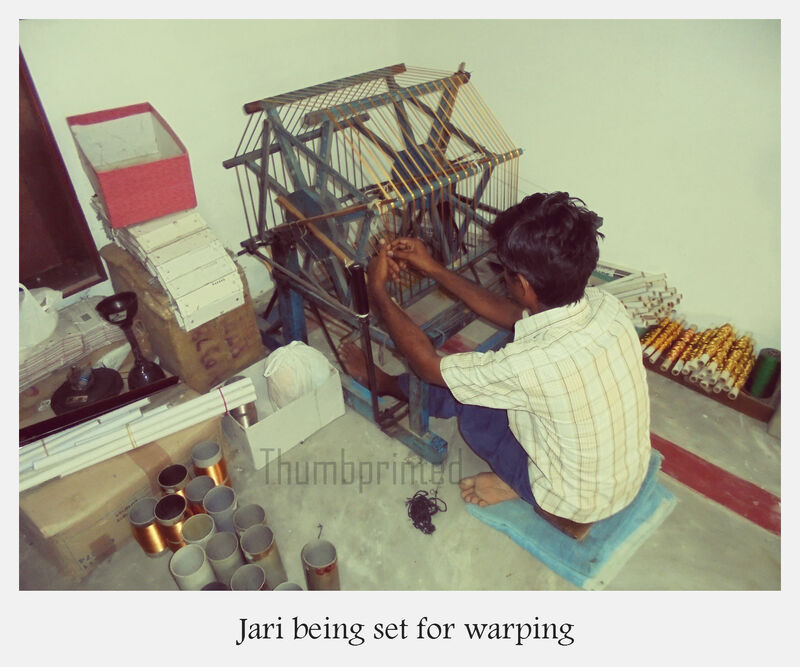 This final spool with a particular quantity of Jari is sent for the weaving process. 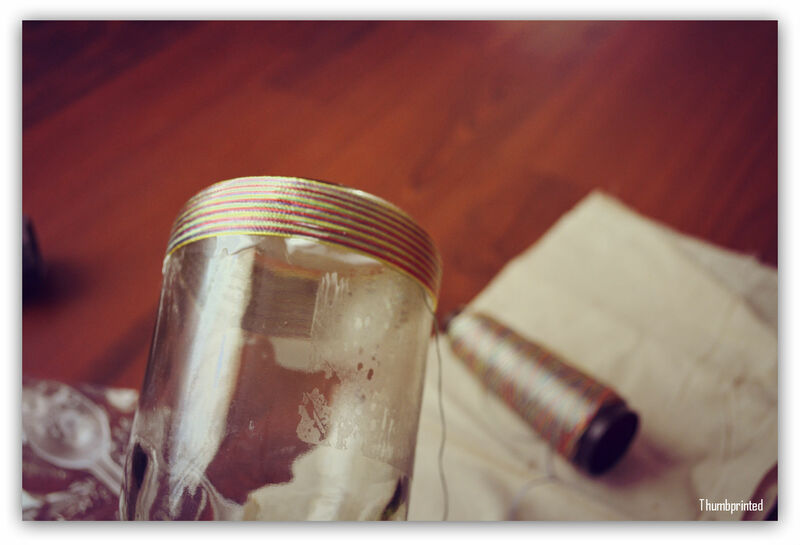 Q : Do you follow a similar process with the silk thread as well? 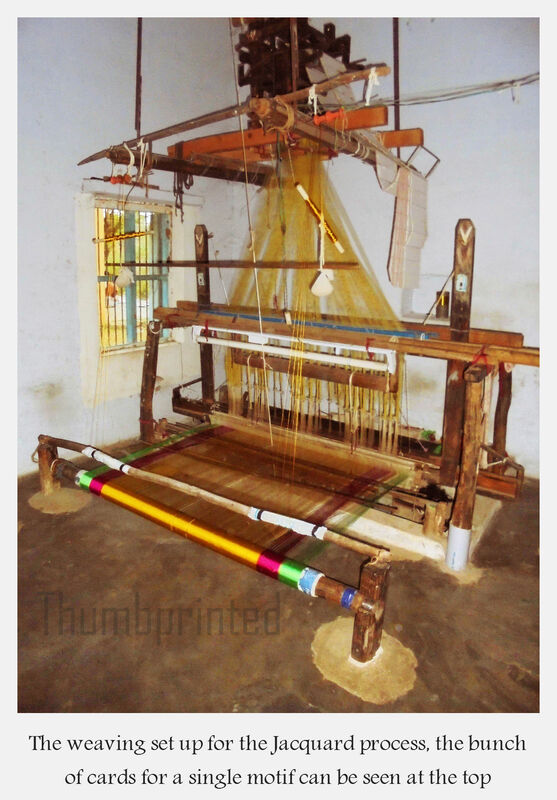 A : Yes after the silk has been dyed, we send it for the warping process, where the silk thread is stretched and set according to the saree pattern. Breakages are repaired, loose threads removed, it is set in a taut manner between two end devices as the entire thread material for either eight or twelve sarees is sorted through. 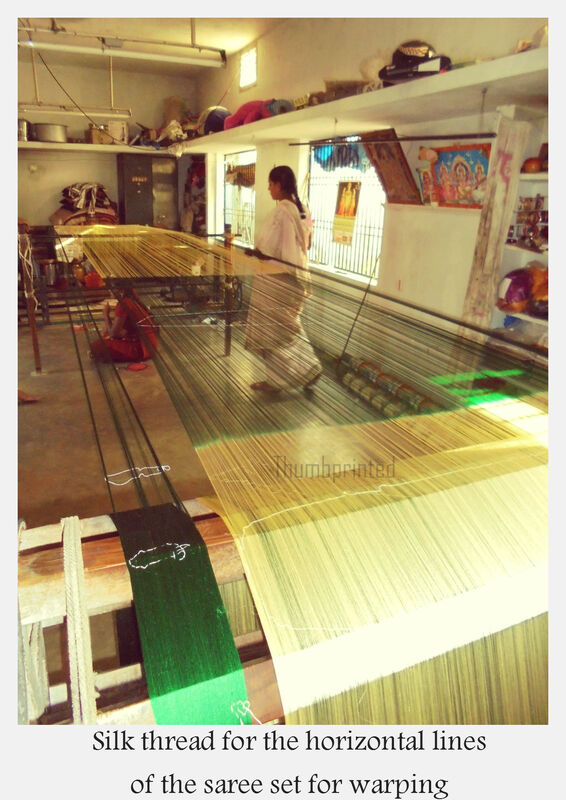 This is entirely a manual process and what makes handwoven sarees special. The sorted silk thread is then rotated on wooden beams, with cardboard sheets inserted in regular intervals for protection. The time taken for this process ranges between 4-6hours. This is then sent to the weaver. 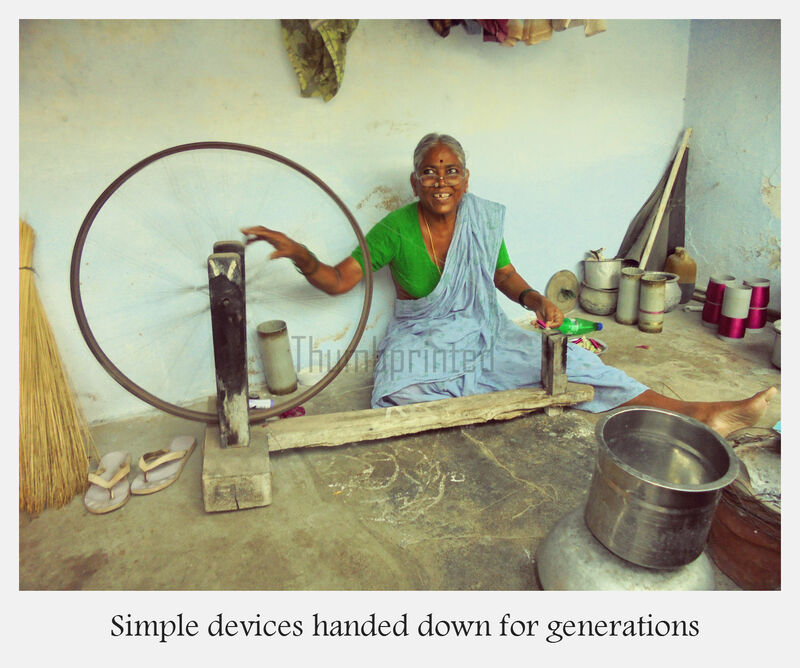 Q : How old are these devices and machines? A : These instruments or at least parts of it can be as old as 100 odd years, some even more than that. 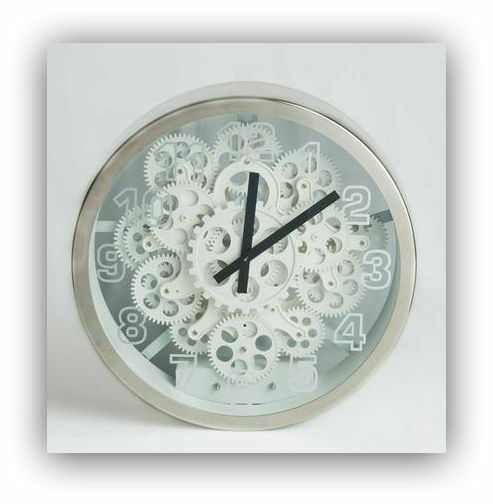 Certain parts are replaced as and when required due to wear and tear. Q : Please describe the weaving process. A : The weaving machine is simple and complex at the same time. 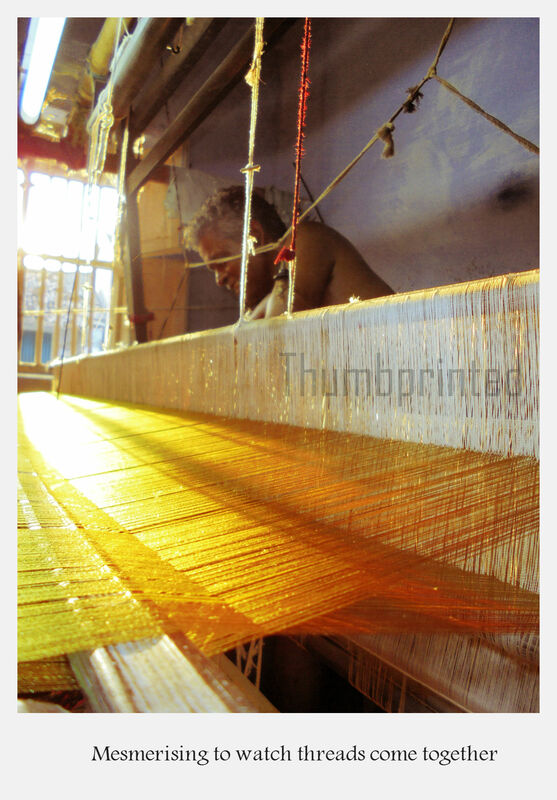 In handloom weaves, the weaver has to use both hands and feet in a continuous process. The main saree body material that has been through the warping process as in the above step is horizontal threads of the saree. 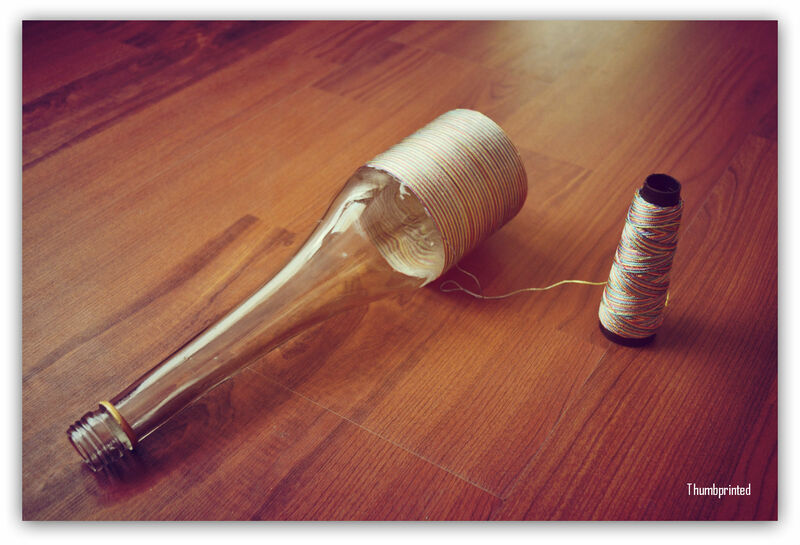 The vertical threads are loaded on something called the weft, the weft is a block of wood with both sides pointed and a hollow in the centre where the vertical thread spool is loaded. 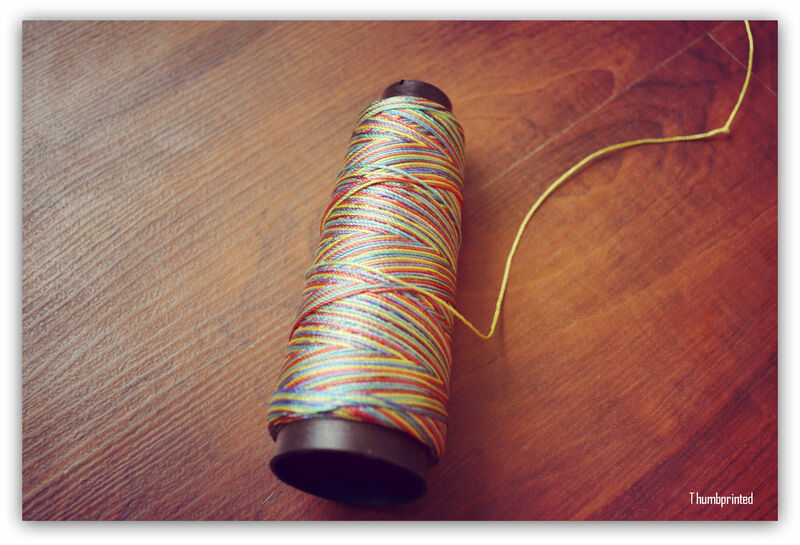 There is a rather simple machine that sets the thread on this spool. The weaver sets the horizontal silk threads through the weaving machine, as there will be threads that get pushed up and those that get pushed down during the weaving process. The weft moves like a bullet from end to end as the vertical threads are weaved in with the horizontal. A separate line introduces the Jari thread for border, body designs or bhuttas. Small bhuttas are done with the hand, while larger designs are done either with the weft by hand or with the Jacquard method. The up and down movement of the weaves is controlled by the foot pedals and the weft is controlled by hand. 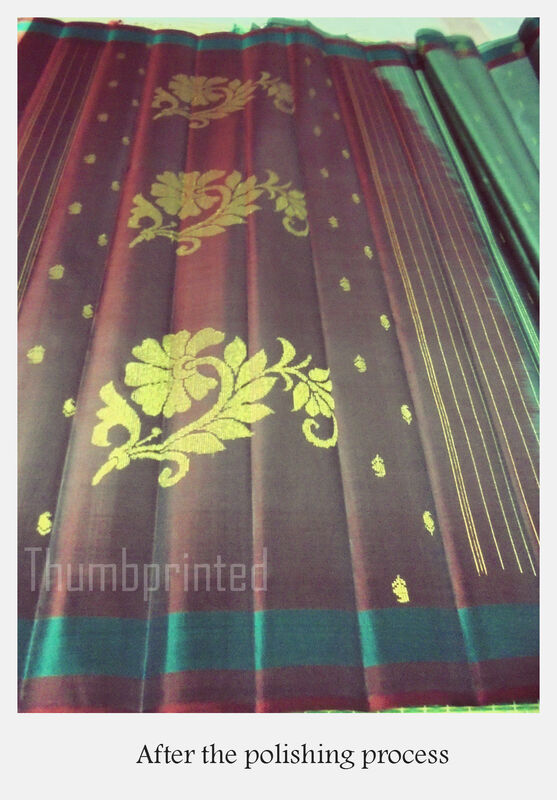 Throughout the process, glue is applied across the saree in small parts as the weave progresses. 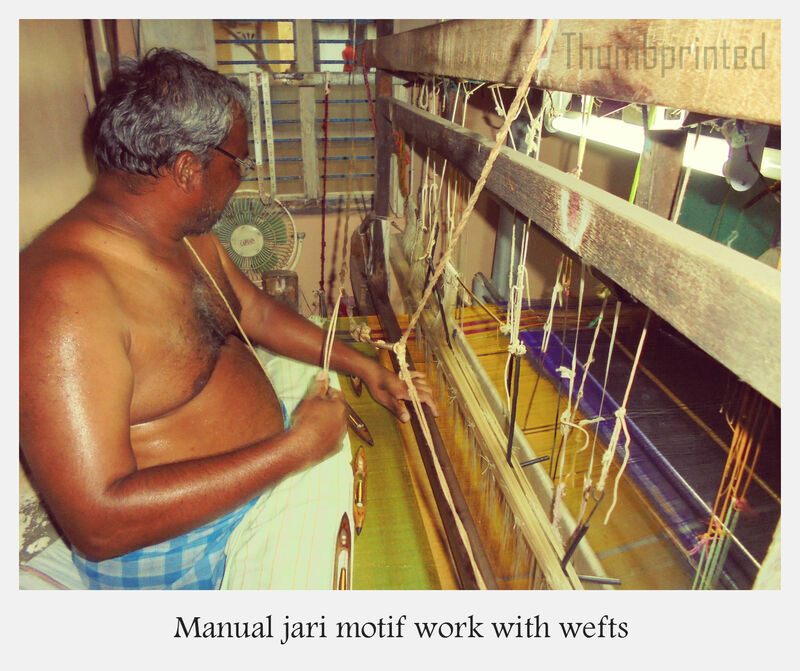 The weaving process differs based on the complexity of the saree design and takes anywhere between 1-3 days. Q : What is Jacquard? A : Doing large Jari designs and patterns by hand can be extremely time consuming, so there are cards punched for a particular design when fed into the weaving machine and thread sorted accordingly, weaves the corresponding pattern much quicker. 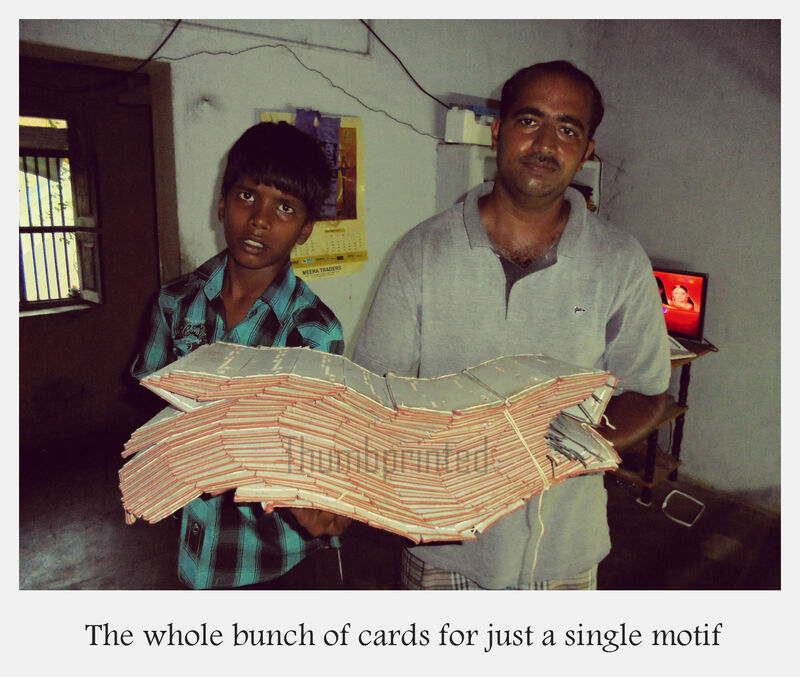 A single pattern is made up a lot of cards, and can be as many as 100 or more. Q : If done manually, how long does a single Jari pattern take versus the Jacquard method? A : When done manually a single line of big Jari pattern can take between 2-4 hours, using the Jacquard the time can be reduced by more than half. Q : After the weaving is complete, is the saree ready to be sold? A : Yes the saree is ready to be sold. However in case of minor stains or crumpling of the fabric, we send it for a process called Polishing. This is a simple process where the saree is stretched across both ends and natural glue is mixed with water and applied and set to dry. This removes any variation in colour and makes the saree look better than ironed! You can even get your old sarees polished to restore that fresh out of the store look. Q : And the final step? A : The next is a final quality check and re-folding the saree to showcase the parts such as border, body and pallu better. Then it is ready to be viewed and bought by customers. Q : Do you sell only sarees? A : Business sees a spike during the wedding season, but sometimes these sarees get bought for other purposes, such as recently tourists bought a good deal of silk sarees to be used as home furnishing. 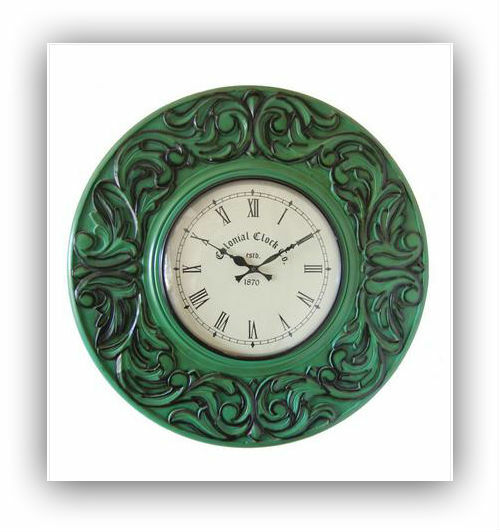 We do produce certain other products such as home furnishing on custom orders. 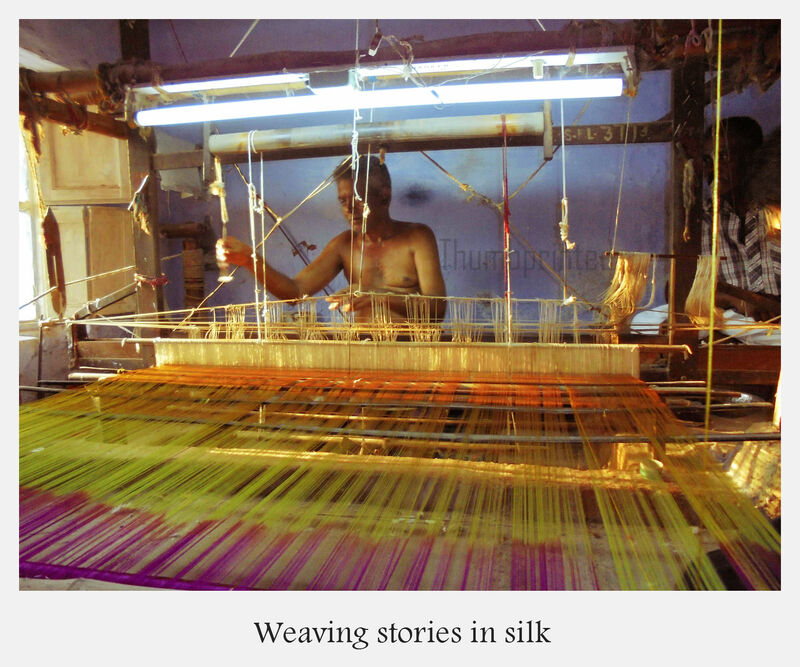 Hope you enjoyed the walk through of the silk weaving process as much as I did. 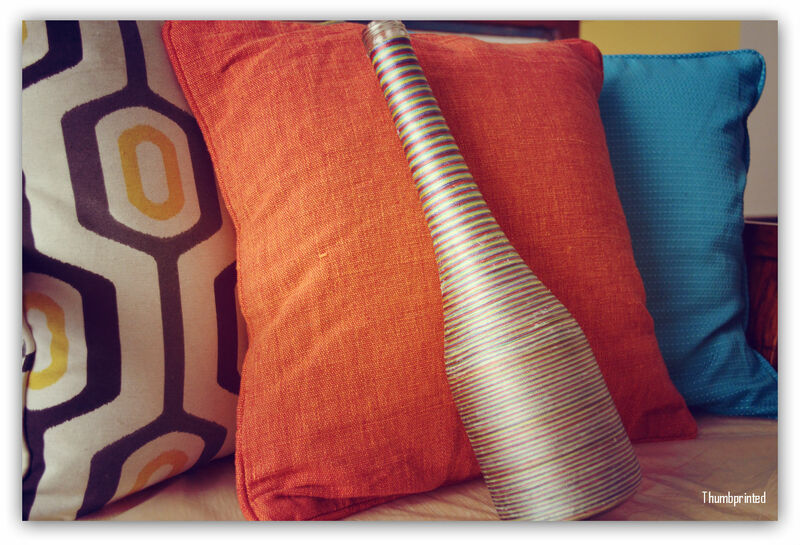 So do you have ideas on how we can creatively use silk sarees in home furnishing? 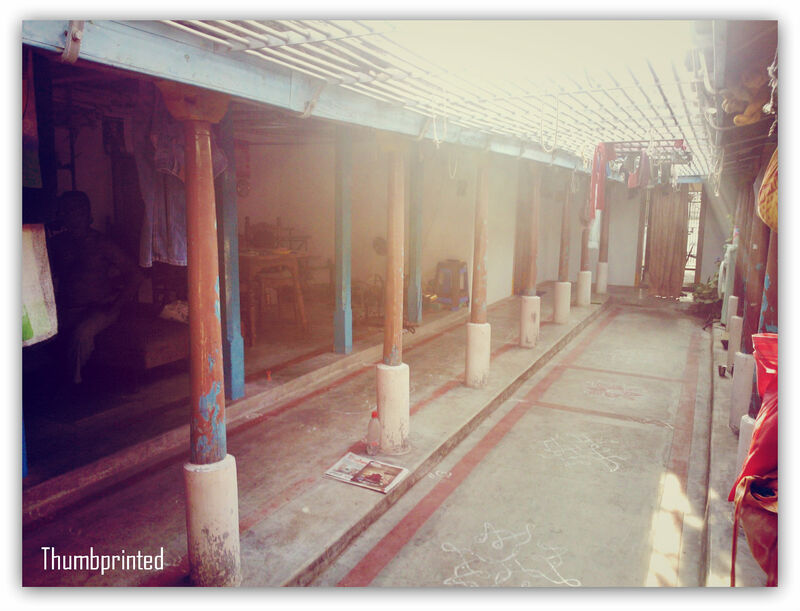 I recently visited a more than 150 year old traditional home in Narayanavanam in Andhra Pradesh. The family has been traditionally involved in the silk saree business for many generations and follow the joint-family system with grandparents, sons, their wives and children all living and growing together. As a recent home owner myself and all the quality concerns I continue to face, the first thing that truly struck me was, wow this building and many parts of it are more than 150 years old, built by the great great grandfather! 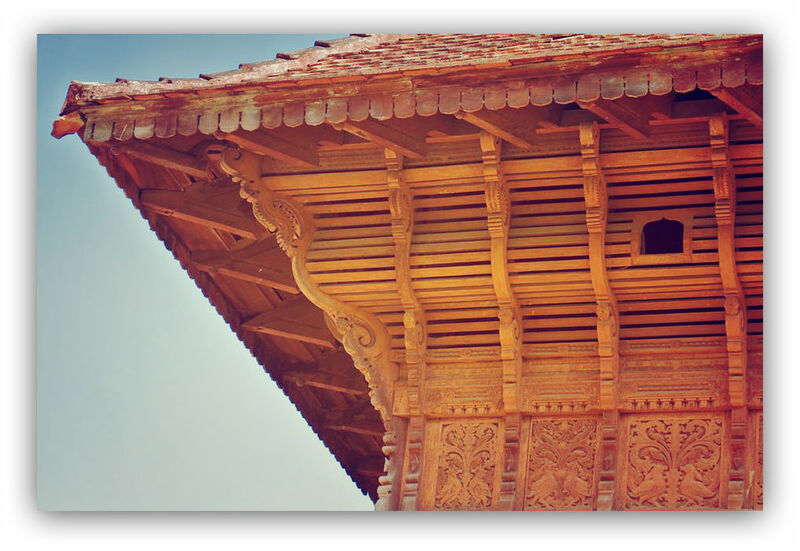 There is extensive use of wood for the ceiling topped by tiles that are as old, walls made of mud and burma teak pillars. This house has stood through years of climate change and seen generations of the family. It was truly beautiful in my eyes. The current generation of the family however are eager for change, they find the old home difficult to maintain and want to tear down the old structure and build a more modernised structure. When they proudly told me of the changes they had already begun to make, I could only think of how beautiful the old structure is and how one could modernise for convenience without disturbing the original style. 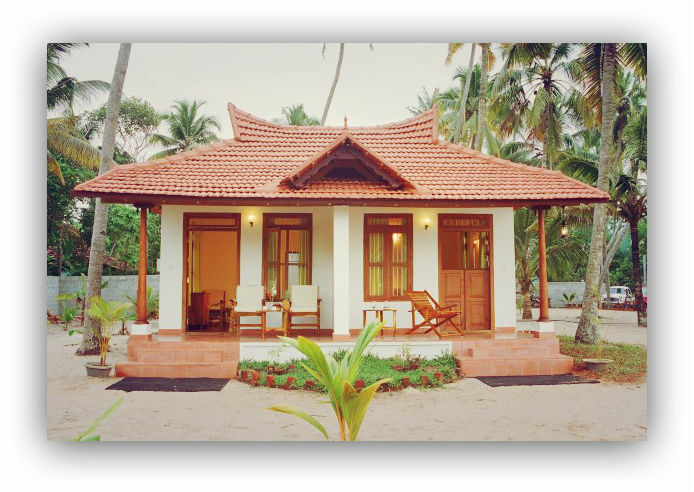 There are some key features across South Indian traditional homes be it in a small village in Andhra or a Chettinad mansion or a traditional Tharavad home in Kerala that I would simply love to live around and wish more modern homes had these. 1. 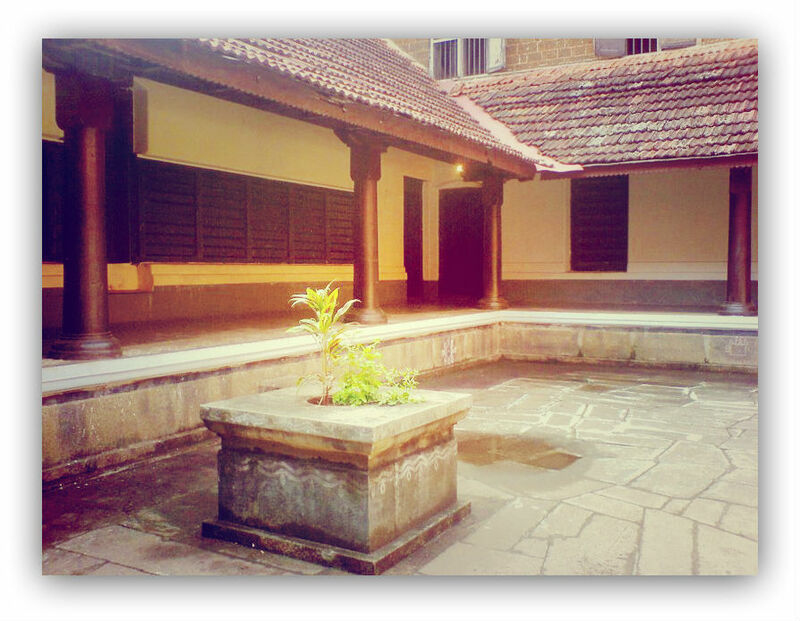 The Thinnai or Verandah at the entrance of the house. This may also be referred to as Muggapu in the Chettinad homes. This typically consists of raised platforms to sit on, spanning the breadth of the house structure, with pillars either made of wood or stone or mud supported on the outer verandah wall. During functions both good and sad, these areas of the homes were used to seat guests. 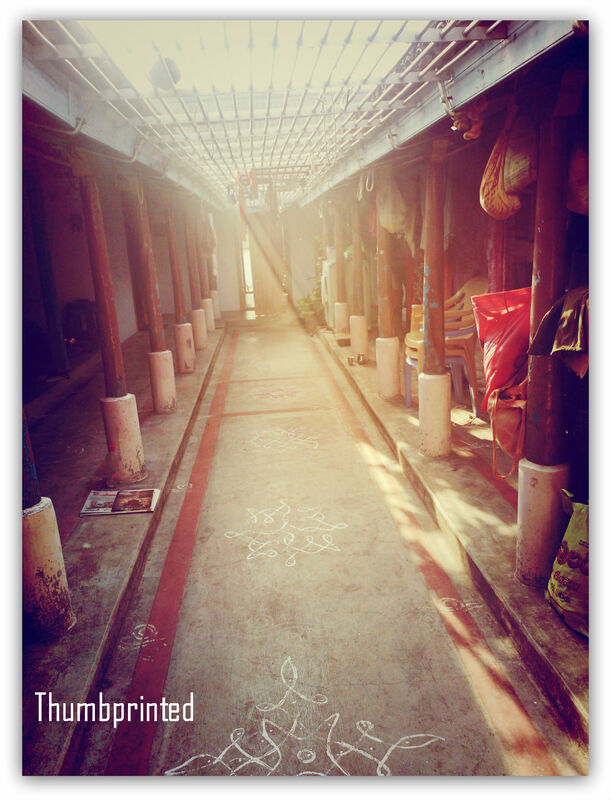 The thinnai or muggapu was also used to play games and relax with neighbors and friends who came calling. The most appealing part of this structure is that while it is connected to the main structure of the house, it still is mostly in the open. 2. The central courtyard : These typically rectangular homes lead from the verandah through the main door into the living section of the home which has a central open courtyard. This is surrounded on all four sides as the living areas of the family, with kitchen, storage areas, bedrooms for each of the sons, bedroom for the head of the family and the passage around the courtyard used commonly by all as the living area. 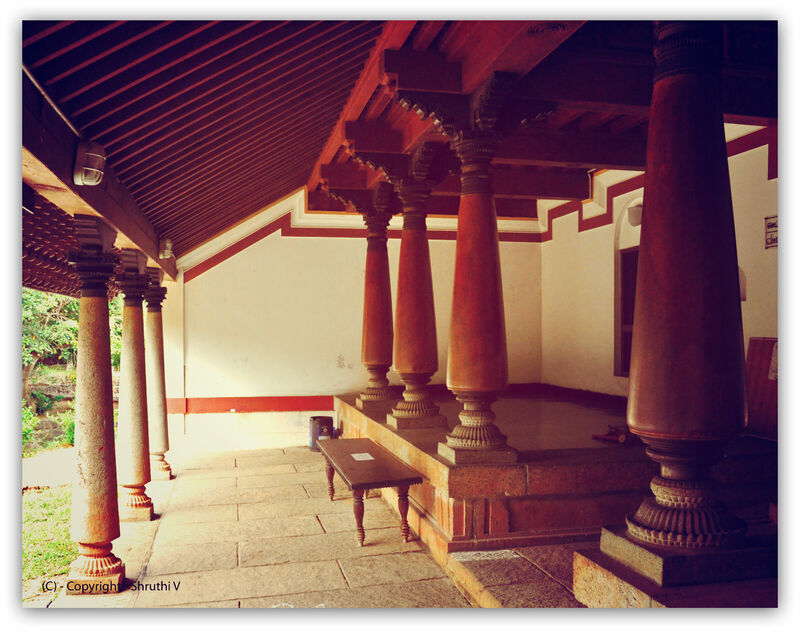 The courtyard is again surrounded by pillars in wood or stone. 3. 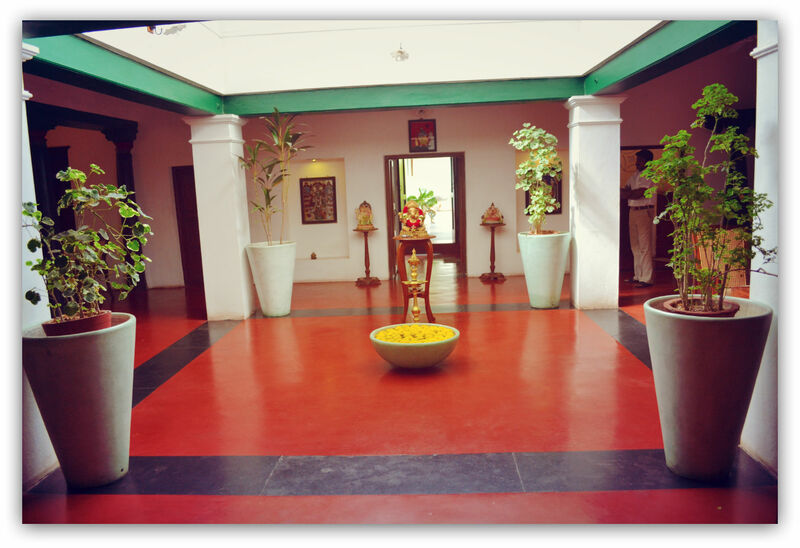 The traditional flooring: Houses those days enjoyed vibrant floors in the form of red oxide flooring with intricate drawings of Kolam (done with rice powder or paste), they are designs made by connecting dots and used to be one of the favorite activities among the women of the household. 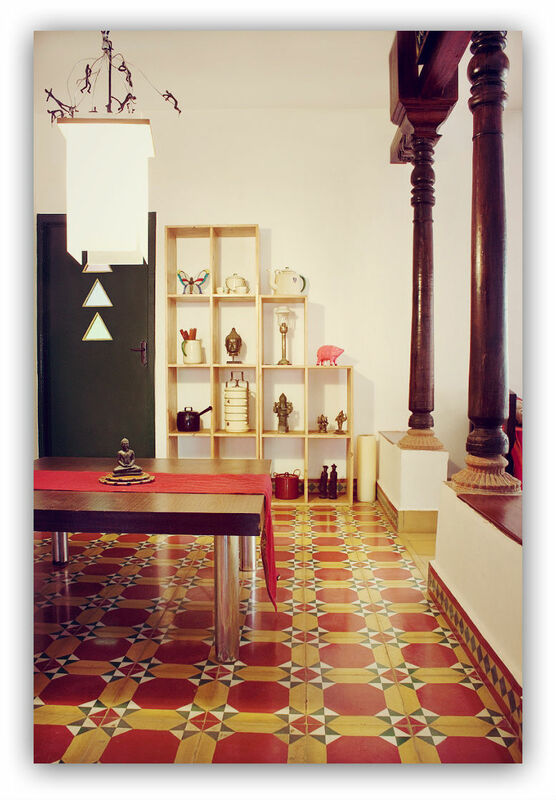 The floors may also have intricate patterns as provided by the Athangudi tiles in Chettinad homes. 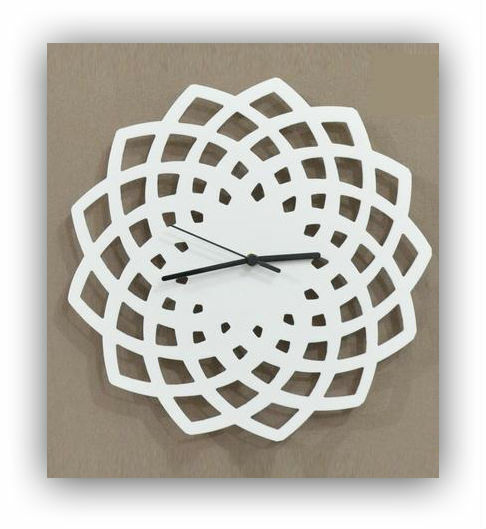 Bringing in geometric or floral patterns and a range of bright colours. 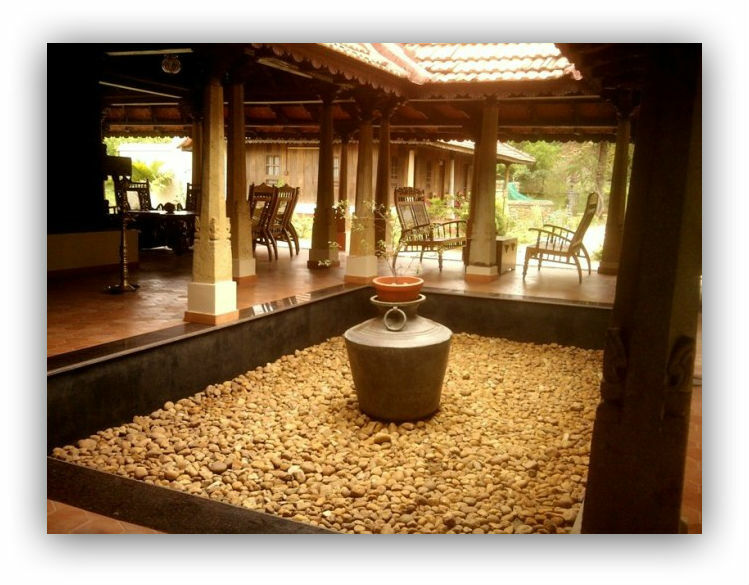 In some Kerala homes the flooring was also done in wood while other village homes even extensively used stone in certain parts of the house. 4. The traditional roofs: The traditional roof structures were made extensively from wood and clay tiles with different levels of intricacy and shapes. 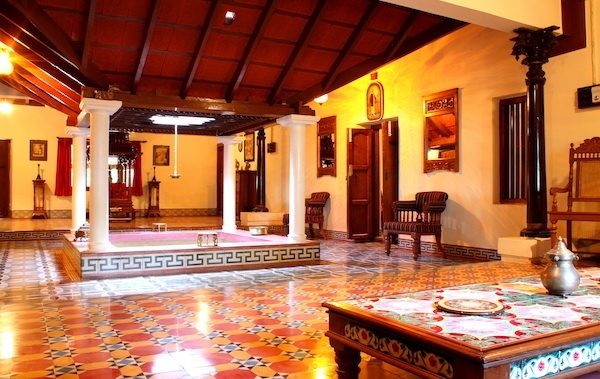 While Kerala homes have more grandeur and woodwork showcased in the ceilings. Traditional homes elsewhere might just have simple wood beading and tile work, complete with sealing of tiles on the outside with Chunambu (slaked lime). 5. The exquisite woodwork: Traditional craftsmen and availability of wood made old traditional homes not just sturdy but also a work of art. The woodwork across the pillars, the jannals (windows), the doors and even the roofs, could be carved out intricately to tell stories of mythological characters or emphasize local beliefs, motifs and structures. Jalli work in the wooden roof structures allowing the play of light around the courtyard or the massive doors with their painstakingly done carvings are all reminiscent of the glory days of traditional Indian architecture. I sincerely hope that these ancient village homes are preserved in their traditional settings. 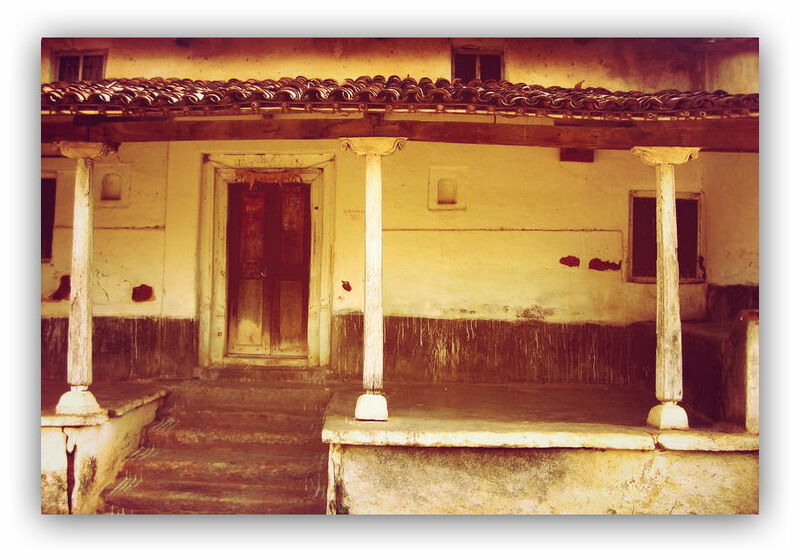 Even if urban dwellers had the inclination and the funds to build such homes in the city today, the lack of yesteryear workmanship and lack of availability of certain type of products makes it very tough to retain this kind of architecture in our current homes. It however is some consolation to know that certain crafts like the Athanagudi tile making is still alive and available for anyone that wants to have unique and beautiful flooring in their house, against which vitrified tiles are no match. 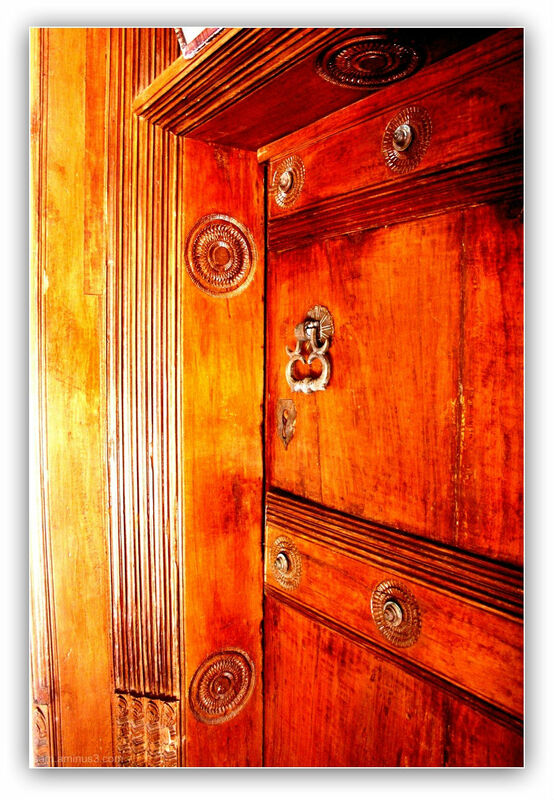 And certain traditional carpenters still available in pockets of Kerala and other regions who create exquisite wooden furniture and doors to custom orders. So that we may use some of this in our homes to retain a little of the yesteryear glory, because a certain beauty and grace only comes with age. 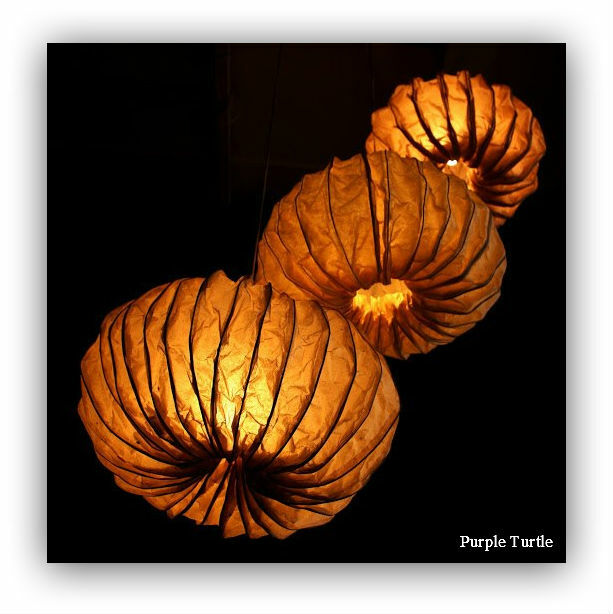 In continuation of my visual walk through of two lighting stores in the city that I find interesting, lets take a look at a rather unique store starting with their unusual name – The Purple Turtles. 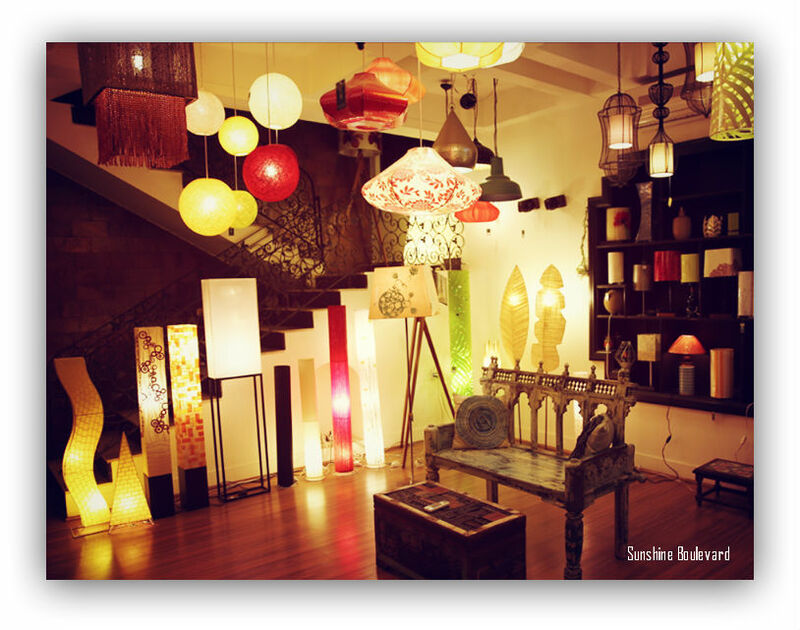 Started by ex-advertising professional Radeesh R Shetty, this store offers designer lighting of every kind from industrial to recycled material. 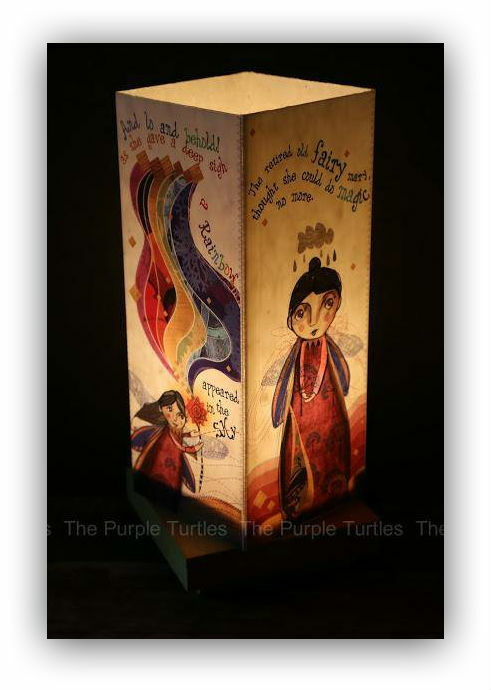 There are lamps that can be customized on customer request as well. They don’t just stop with providing unique lighting solutions, but provide lighting and design consultation as well for both residences and commercial projects. 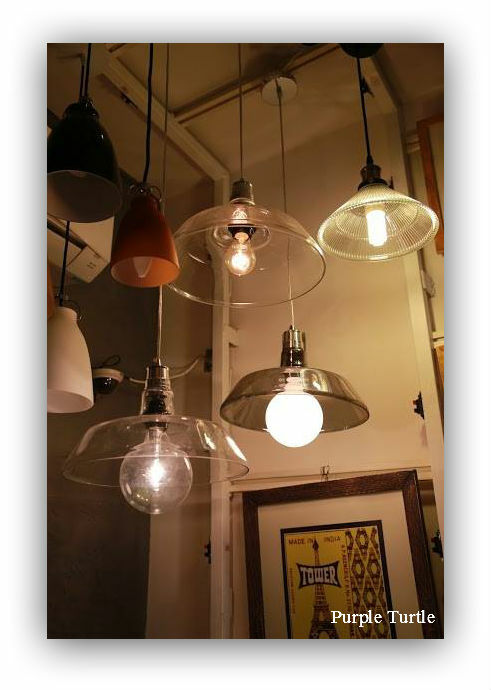 Having been around the city for more than five years now, this lighting store albeit a little expensive can add that special something to your home. 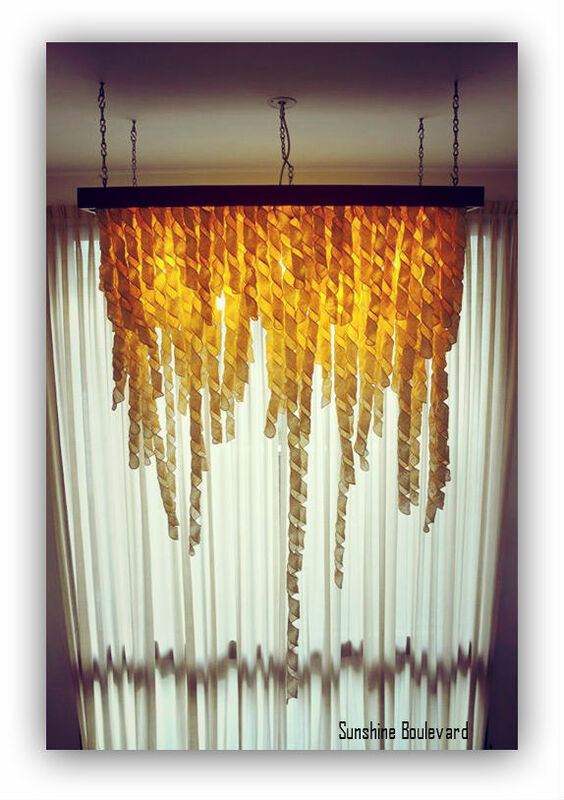 I love this type of ceiling lamps. They remind me of festival fairs and the beach cafes. It also has a very earthy feel, natural fiber, thread, coir or wool is used, as you can see they come in a range of shapes and colours. I have similar ones for my dining area, and they look great! 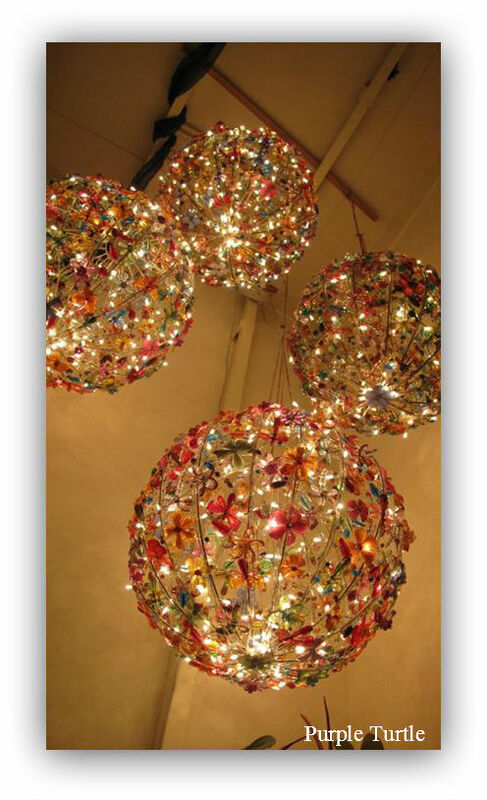 These bohemian firefly bead globes are simply dreamy. Made with metal string and numerous tiny beads, provides this overall effect. 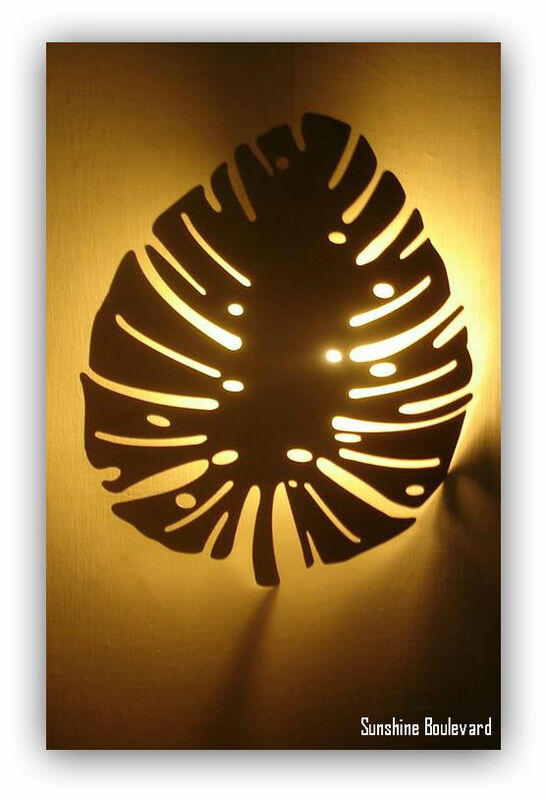 Banana fiber paper has turned out to be a great idea in lighting. This paper has a unique texture making it look great with or without the light turned on. 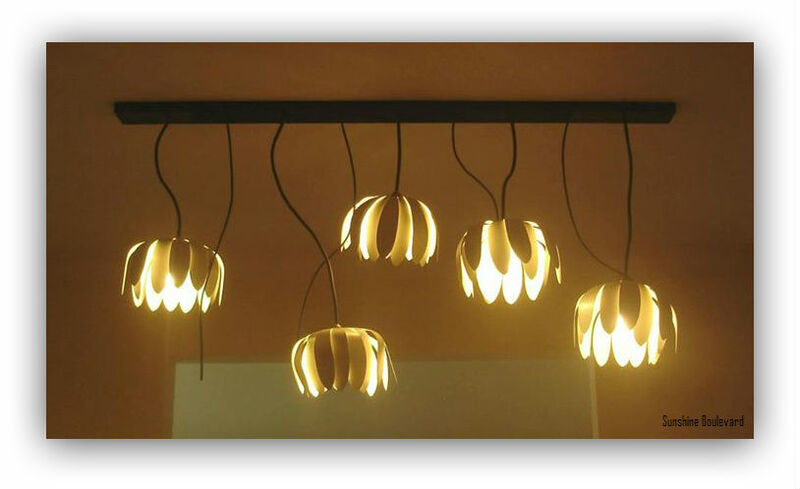 Besides, the versatility of the medium has allowed various shapes and themes to take form in this range of lighting. 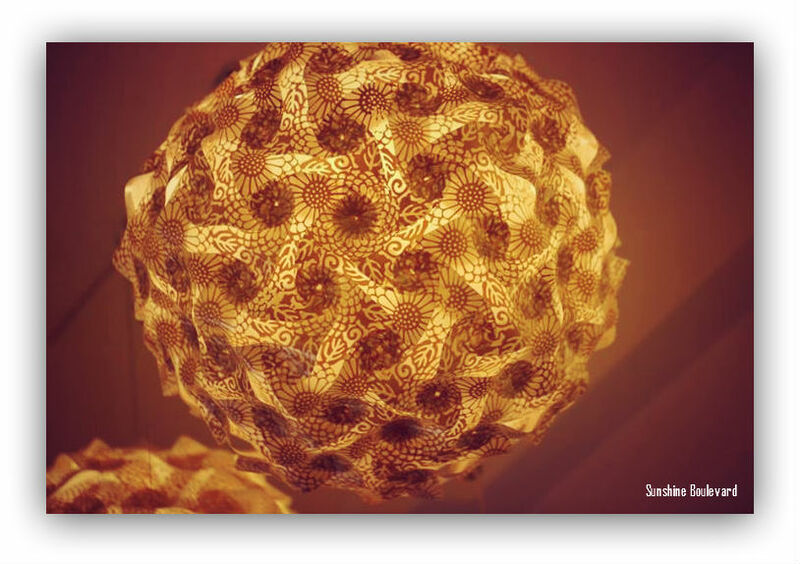 Above is sea urchin inspired ceiling lamps. Banana fiber paper is made from the bark, stem and other un-utilised parts of the banana plant on harvest. Here we see it as an oyster inspired table lamp. 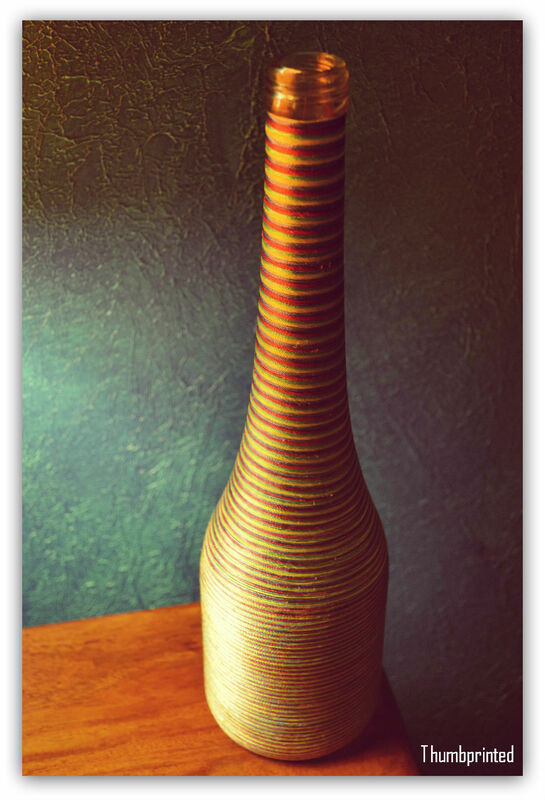 Brass, copper and other metal inspired lamps are a rage these days. 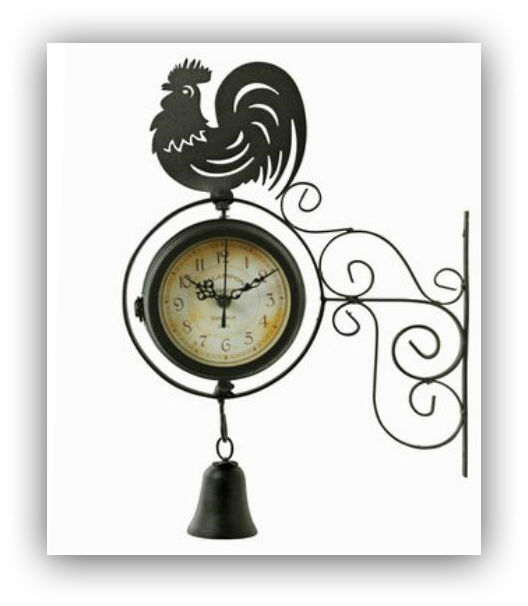 People are increasingly appreciating these metals in the form of handcrafted home decor items. 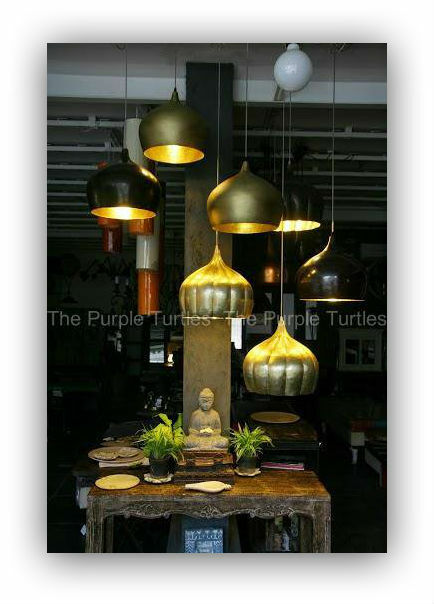 Here are some metal inspired lamps/ lanterns for the table or floor and ceiling. 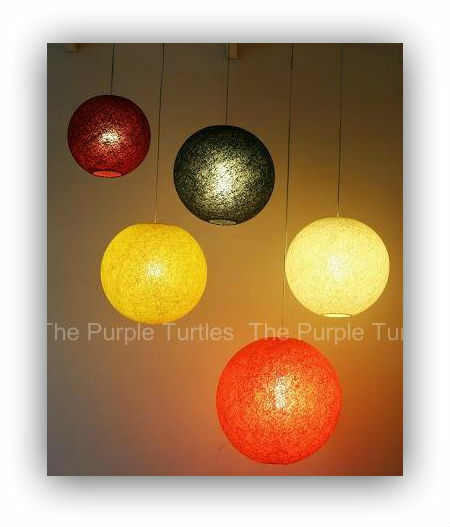 Lights with different kinds of fabric are also popular. Silk being a favorite for its sheer glamor. There are other textiles such as cotton as well with interesting dye, motif and stencil treatments. 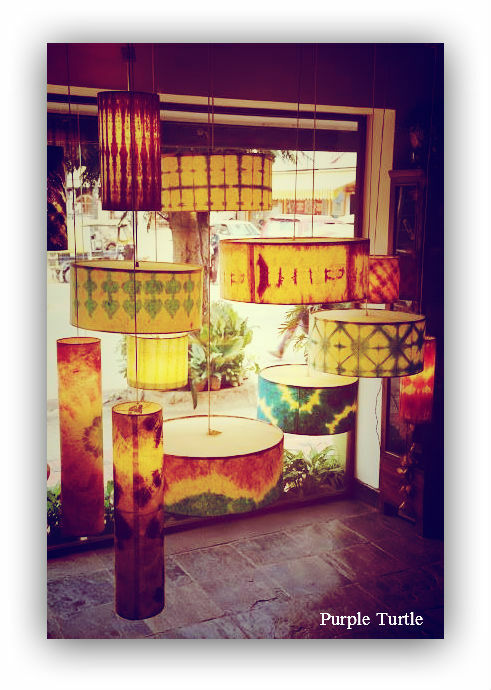 Here are some Shibori Dye lamps that are designed by Jenny Pinto. This is a popular Japanese method of cloth dyeing. In India we refer to this as tie and dye, such as Bandhani famous in Rajasthan and Gujarat. 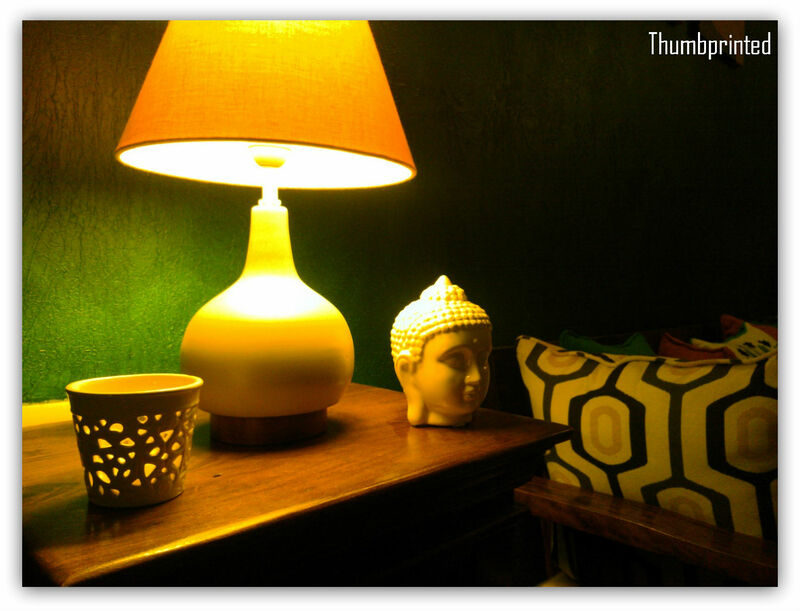 Glass lamps, be it plain or coloured have a timeless quality about them. 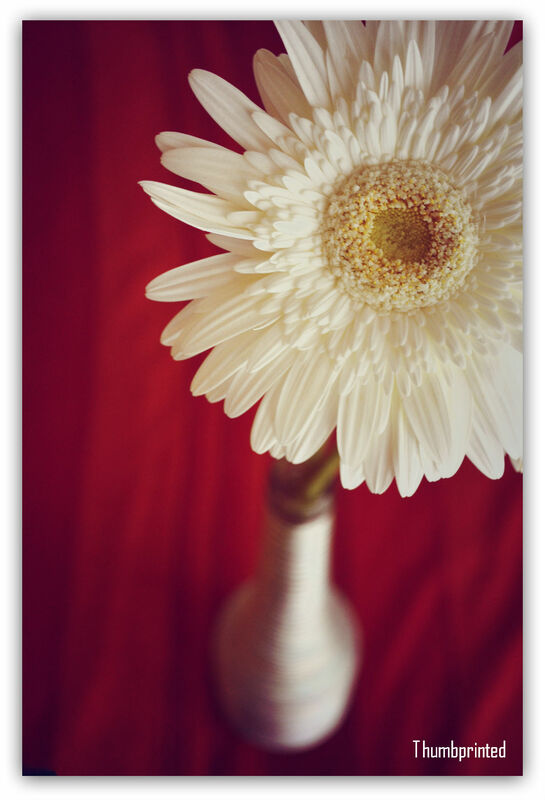 Have a little something to brighten up any corner of your home, here simple is beautiful. 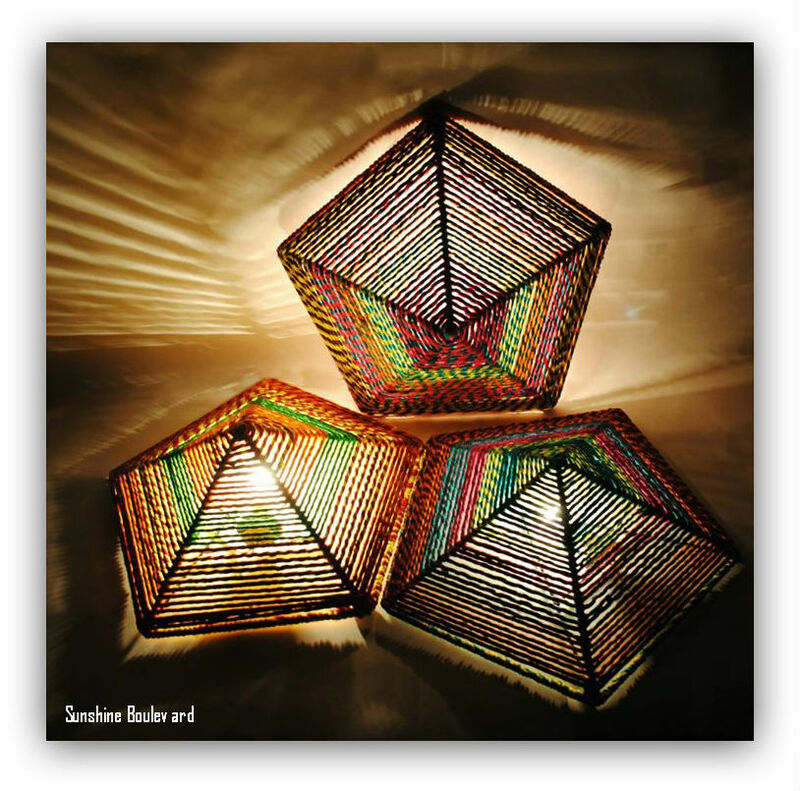 From rural India to mainstream art, many crafts and arts from lesser know parts of the country are being recognized and revived in the form of products for home and office. 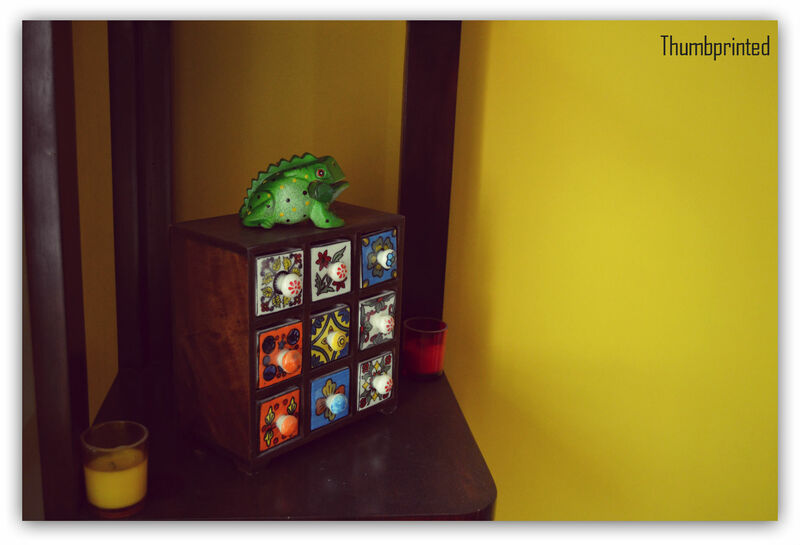 Channapatna in Karnataka has always been popular for the craft of wooden toys and accessories. 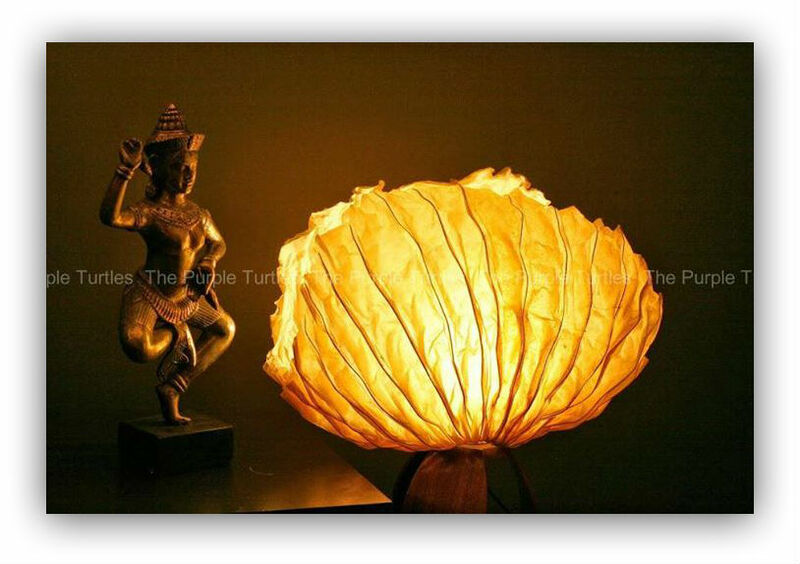 Bringing that into the limelight, here is the store’s range of Channapatna table lamps. And some hand painted touch of whimsy to sum up this visual store tour. Head over to their facebook page here to know more about them. They also deal with home decor accessories and furniture. 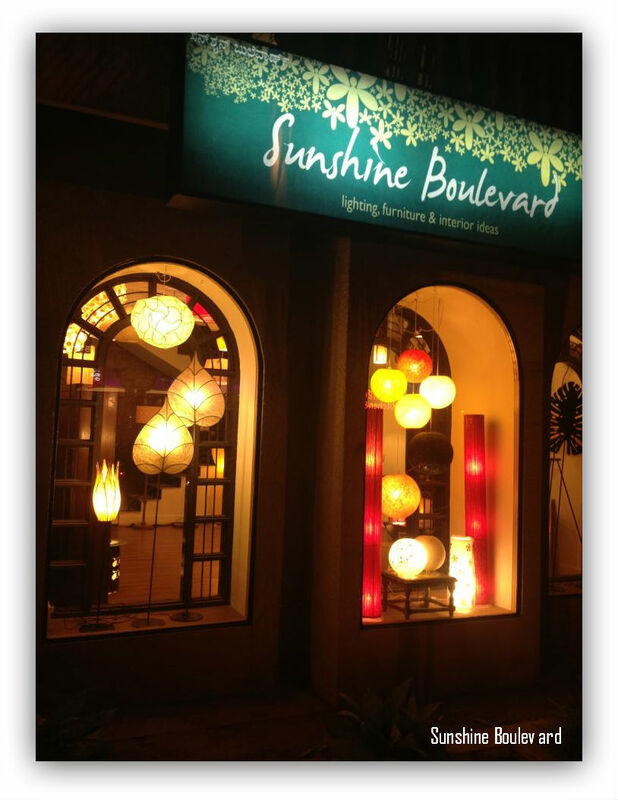 Sunshine Boulevard – Let There Be Light ! Over the next two days, I’m going to walk you through two magical and unique lighting stores in Bangalore, India. I have been to both stores, on more than one occasion to just relax and soak in all that radiant beauty around me. And no matter how many times I visit, I still get tempted to make another trip for some inspiration. The first of these shops that I stumbled across is the Sunshine Boulevard, situated in Koramangala 4th block, it was love at first sight for me. Just the way the shop looks, standing out from the traffic and other buildings like an oasis of bright treats. 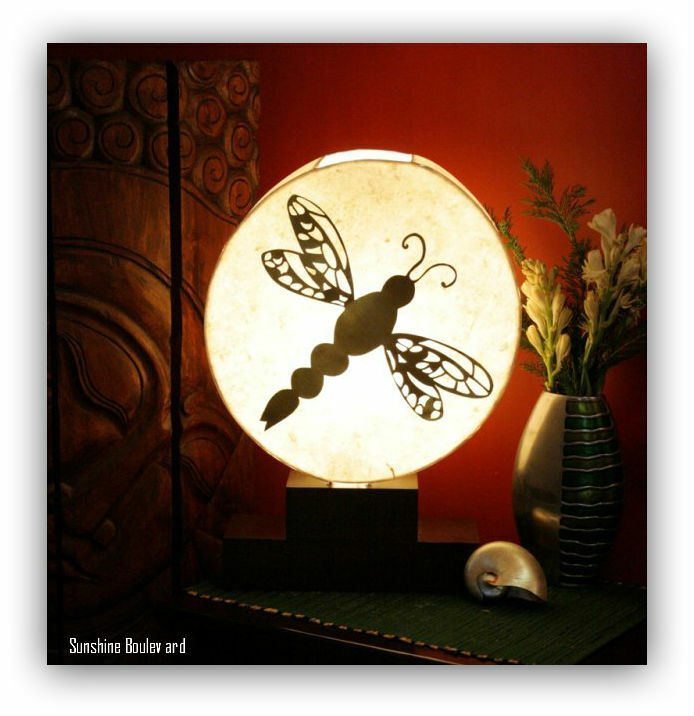 I love their logo and signboard as well, it seems to be calling out to you, to step into a world of summer fairies and elves and their magical lamps! 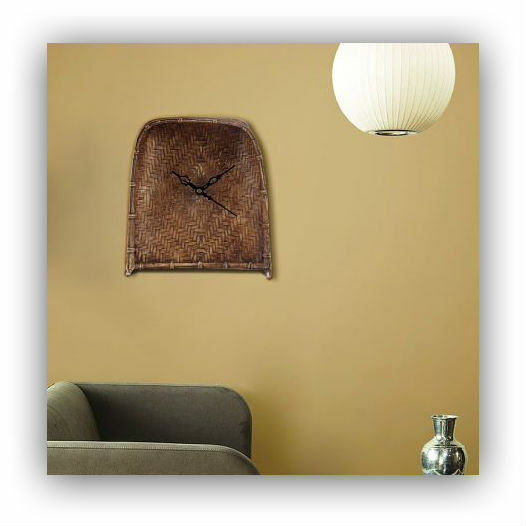 Their products range across different materials from glass to banana fiber. 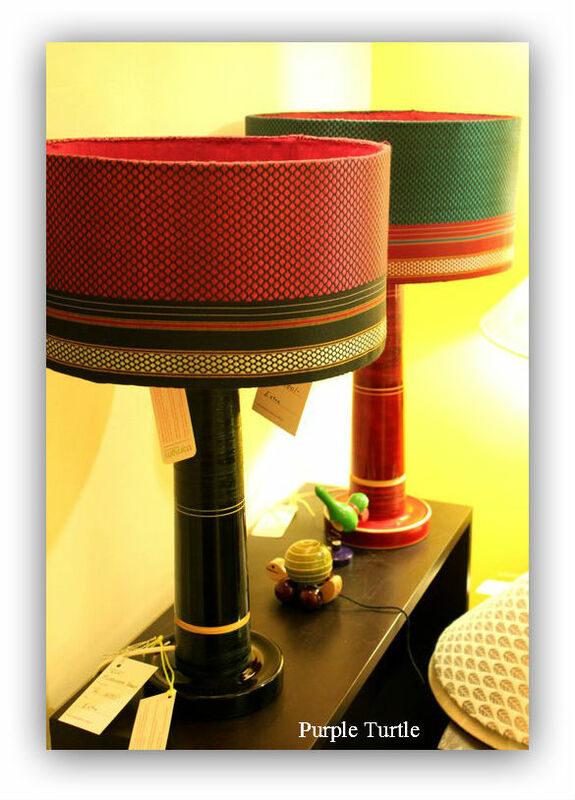 The lamps are made by leading designers from India, with many pieces being unique and in limited numbers only. 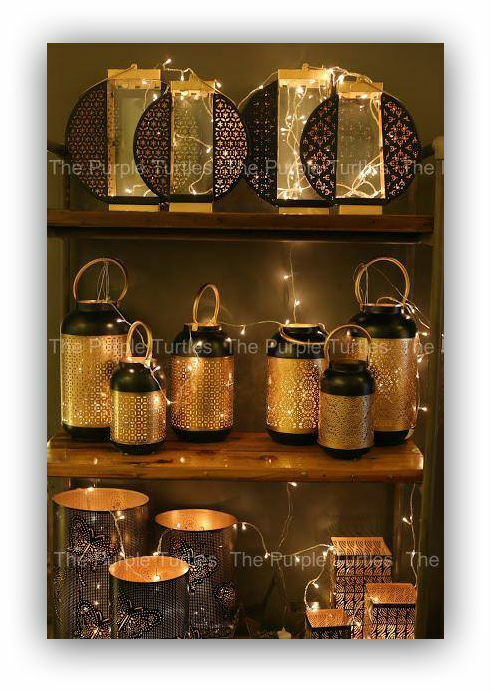 Certain others are made by rural craftsmen, lending an authentic and ethnic touch to these handpicked lamps. 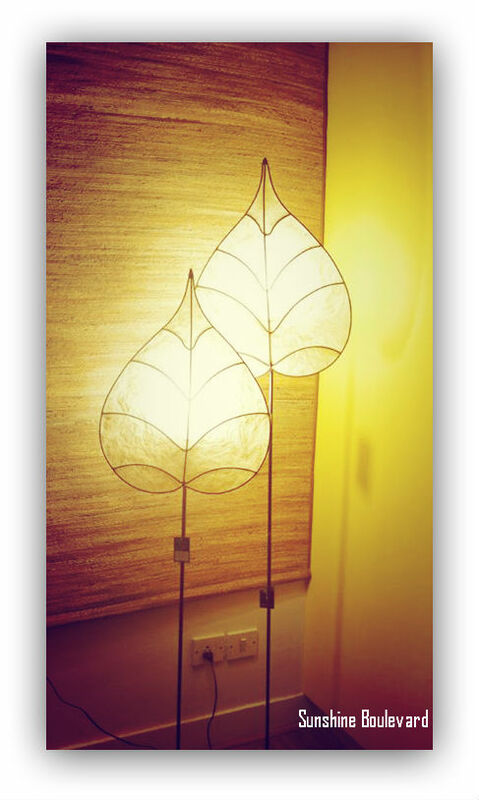 Here are some of their lighting wonders. 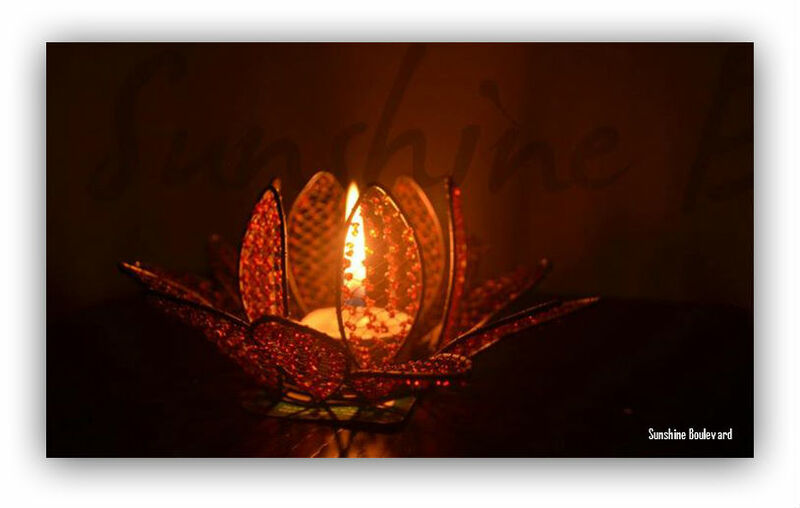 Visit their store in Koramangala or their Facebook page here , to know more about them, they also deal with other interesting home accents besides lighting. This sunny yellow accent wall in our dining and kitchen brings cheer to every meal! It is good to be back after the weekend break, last evening we attended our neighbor’s house warming and then had friends over who are still in the process of getting their new home built. Among the topics of conversation ranging from home loans to modular kitchen vendors, we also spoke about designing and decorating our homes. So how much effort or fun is decor truly? Considering architects and interior designers get paid a bomb for each project and even electricians charge exorbitant rates for fixing pre-assembled lights in India, interiors do take some effort, right? Before I moved into my new home, I extensively researched Indian and global decor blogs for ideas, inspiration and do’s & dont’s. 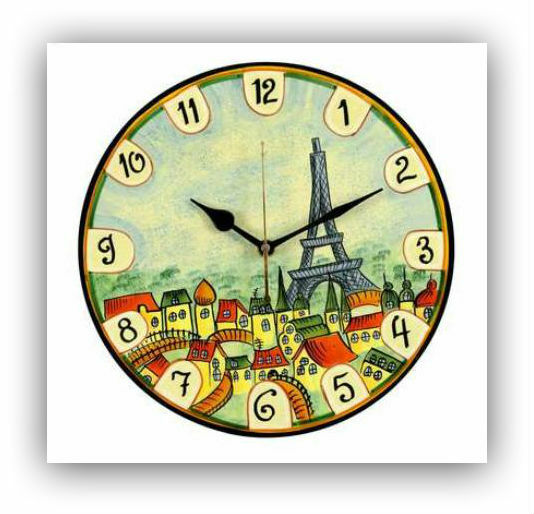 Some of these blogs spoke of how design and decor has to be an effortless process and primarily fun. 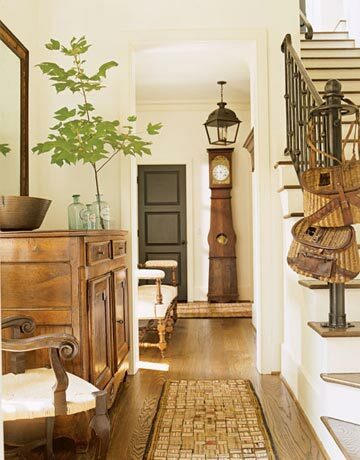 I agree to the extent that by effortless they mean, don’t bother filling every nook and corner in your home. But other than that, in my personal experience, yes it definitely takes effort. So as much fun and exciting the process of designing and decorating your new home is, it also takes plenty effort and planning. Of course that is exactly why it becomes an unforgettable experience! 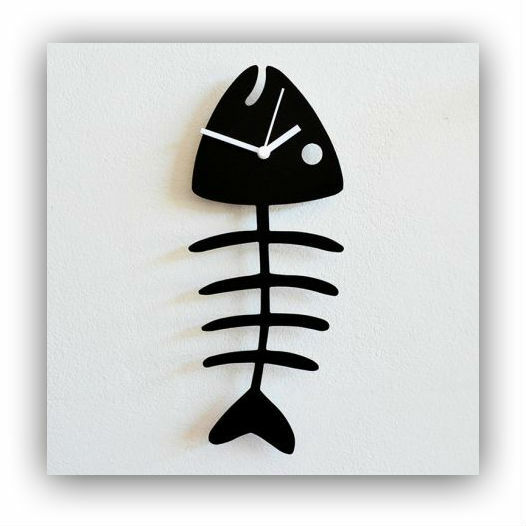 And more important than anything else, this is the simplest way to personalise your home. 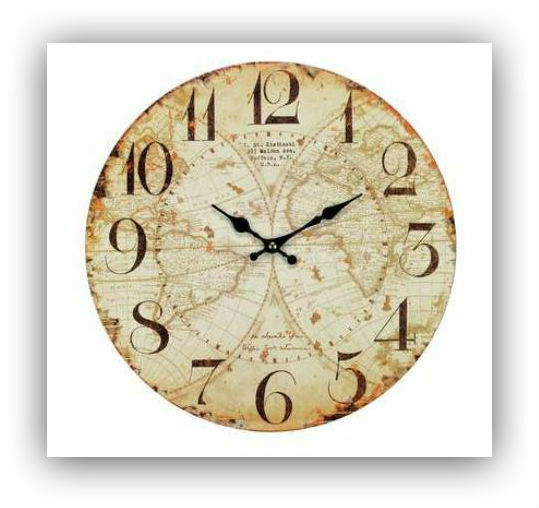 Personalising your home is much more than displaying family heirlooms and curios from travels. It starts with your bricks and walls, because your choice and your family’s choice in every step of the process, from the colour of your walls to the furniture you buy will make your home uniquely yours and special for life! And of course a few years down the lane, as your decor evolves and only involves redoing certain aspects such as your sofa upholstery or bringing in seasonal elements, decor truly becomes just fun! Are you doing up your home, what is your take? I would love to hear your thoughts! 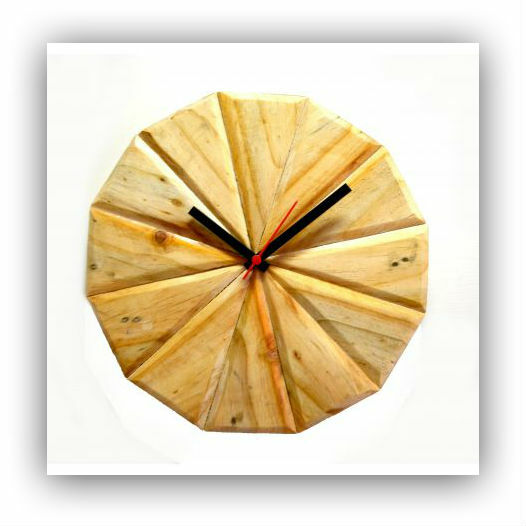 I found this interesting as this is used as ‘moram’ (in tamil) to sort through rice grains and remove unwanted particles such as stones or husks, but to see it in the form of a clock is quite something! 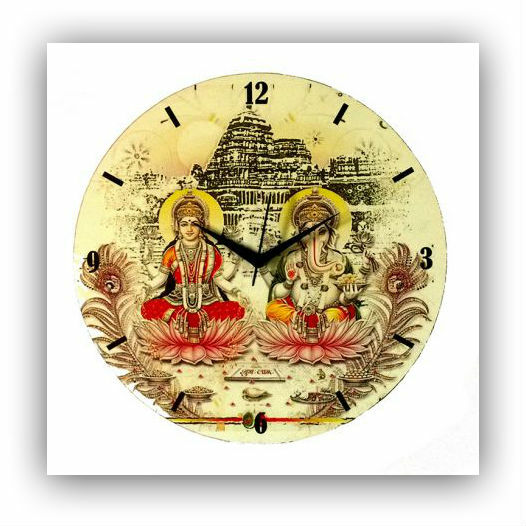 Two of the most popular Indian gods – Lakshmi, the goddess of wealth and Ganapathy, the god to ward of evil and remove obstacles, on your clock! 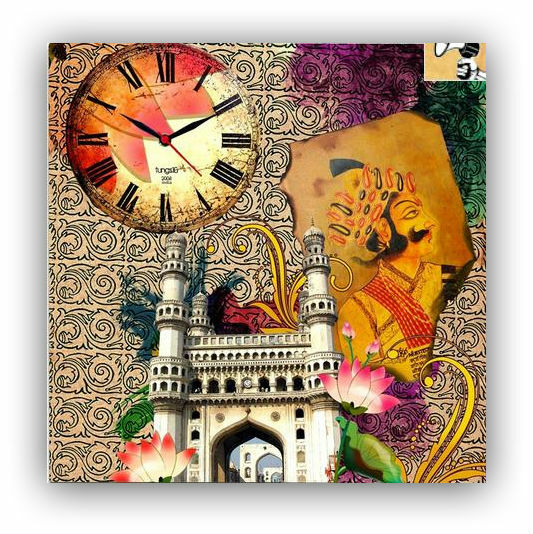 A unique decoupage inspired wall clock with Mughal references There are many more clocks of all themes ranging from sports to politics available from a range of brands such as Tungs, ColorSaga, Silhouette, Blacksmith, Panache etc across online websites like Zanzaar, Pepperfry, Jabong, Fabfurnish etc. 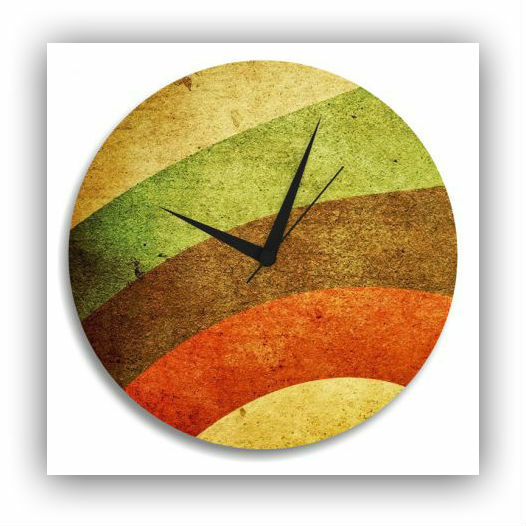 So what style would you prefer for your clocks? 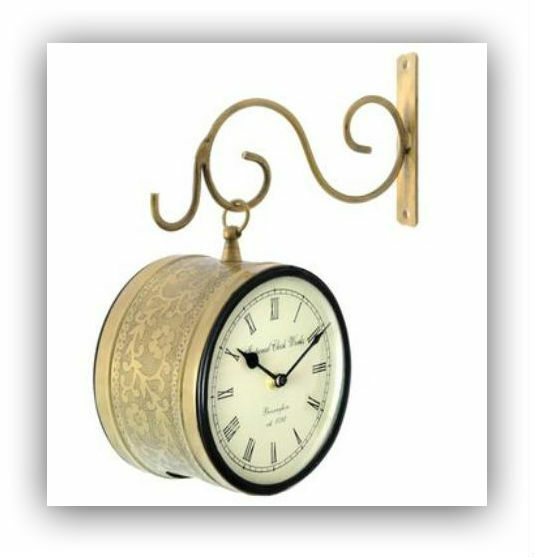 Unless of course you have one such timeless beauty at home! Sigh!